It was one of those days that there were good moments and also the not-so-good. 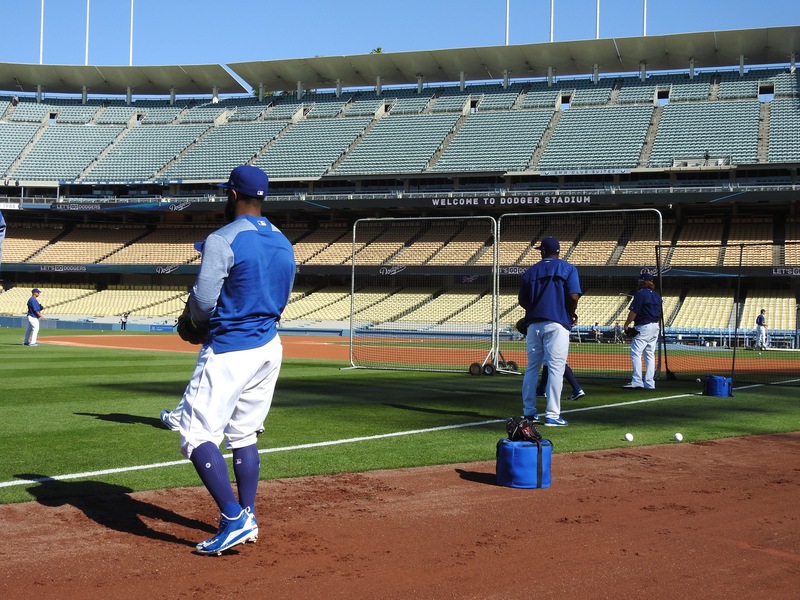 The drive to Dodger Stadium was surprisingly smooth even though it was a Monday. 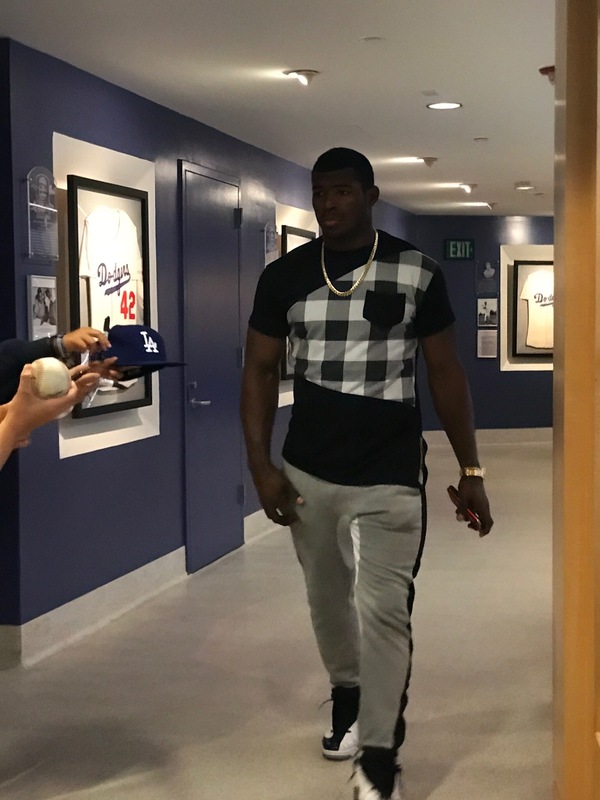 That is a good thing since it seems that the trip from Long Beach to Dodger Stadium lately has been arduous and frustrating. I had been looking forward to this particular day for many reasons. 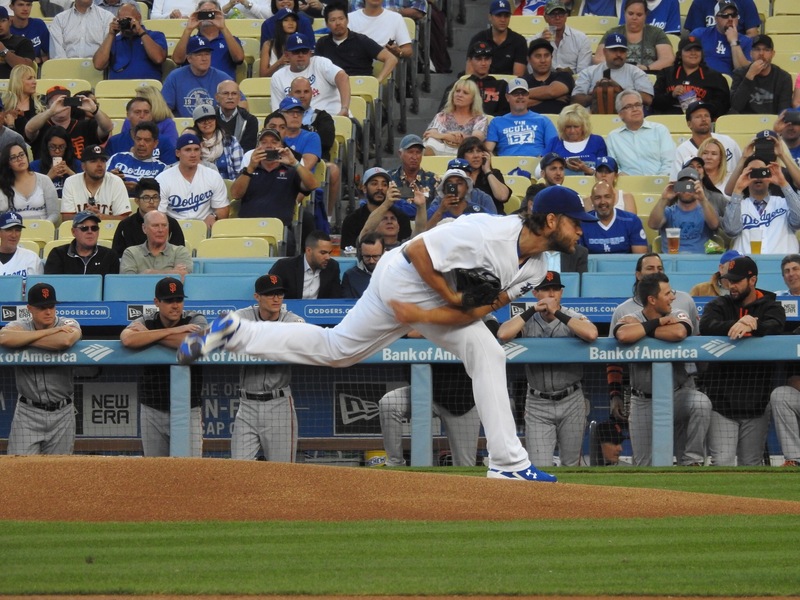 Clayton Kershaw was pitching against Johnny Cueto. 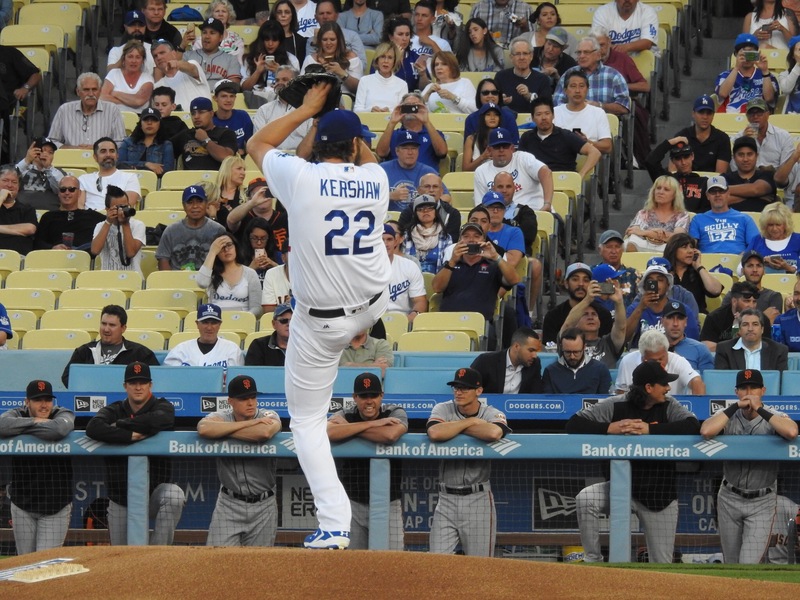 The Dodgers were playing the Giants. 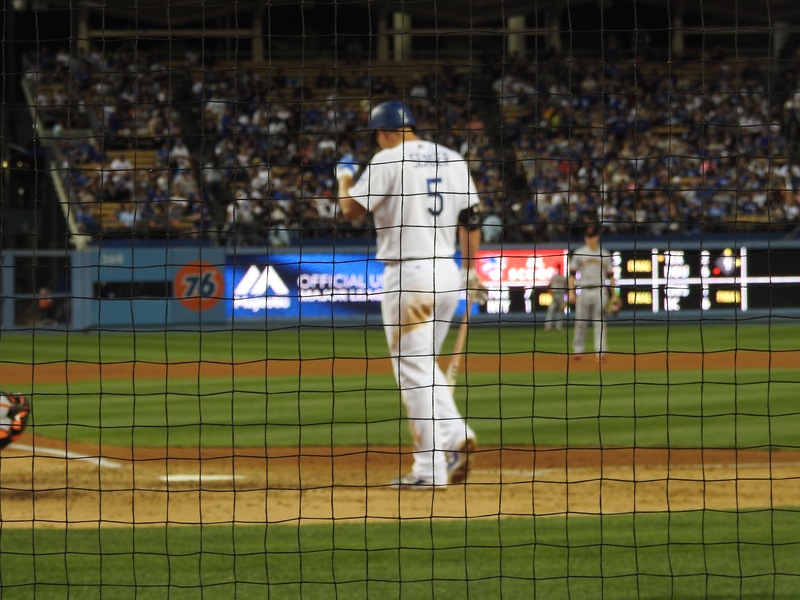 And maybe most of all, I had won the sweepstakes prize of the day on Saturday: two tickets to the Lexus Dugout Club. One of the perks of being a season ticket holder is having a Dodgers Pride card. If you scan the card at a kiosk, you are entered in a contest for prizes. Saturday was the first time I had swiped my card since the season had started. I went up to the Suite Level to see what my prize was when I got an alert on my phone that I was a prize winner. 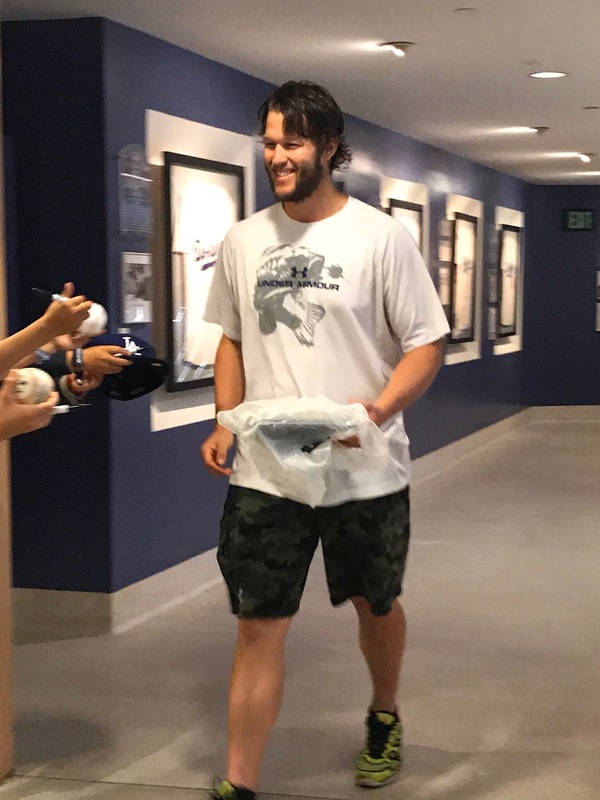 I’m not new to winning a Dodgers Pride prize. Last season I had won 2 baseline tickets. I already sit in baseline so I turned it down. The day of the tickets was a Wednesday day game as well so I definitely knew that no one I knew would want to sit in the hot sun. 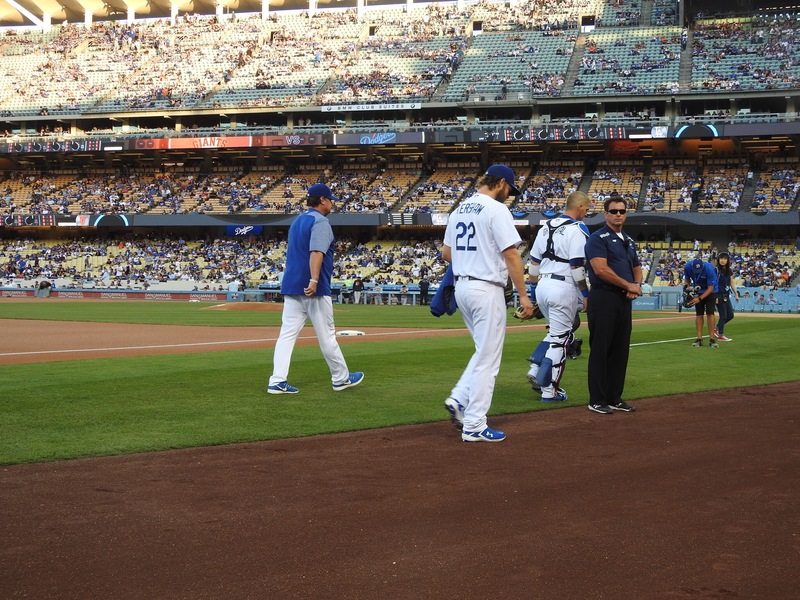 I chose an autographed Yasmani Grandal ball to the surprise of the Dodger reps. I thought it would be better if someone else got the baseline tickets who would appreciate it. When I found out that my prize Saturday was two dugout seat tickets, I was happy and surprised. I did have to sign all kinds of tax forms since this is a huge prize. 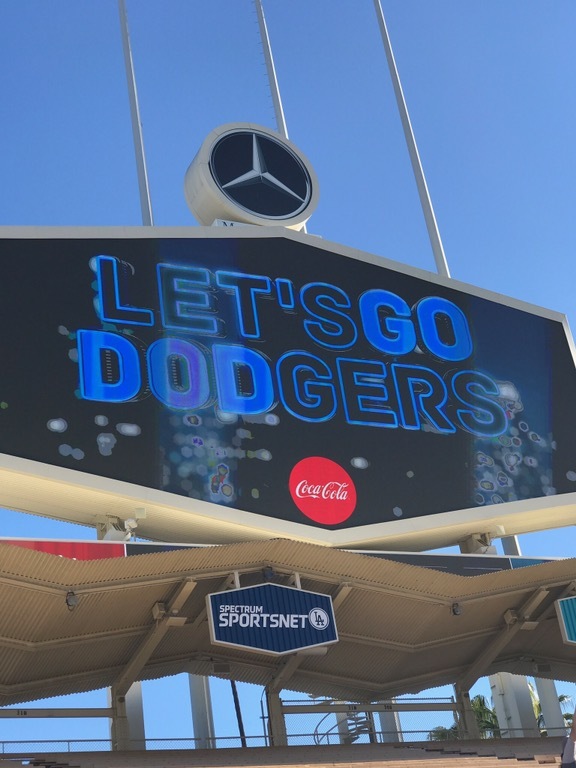 Thank you Dodgers!! I wanted to keep to my usual routine. 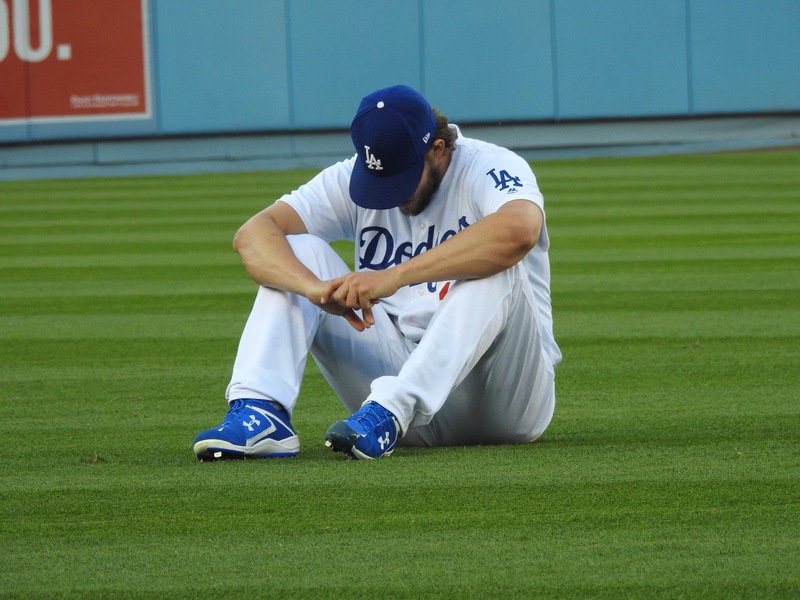 I am a little superstitious or maybe too set in my ways…a little like Clayton Kershaw. 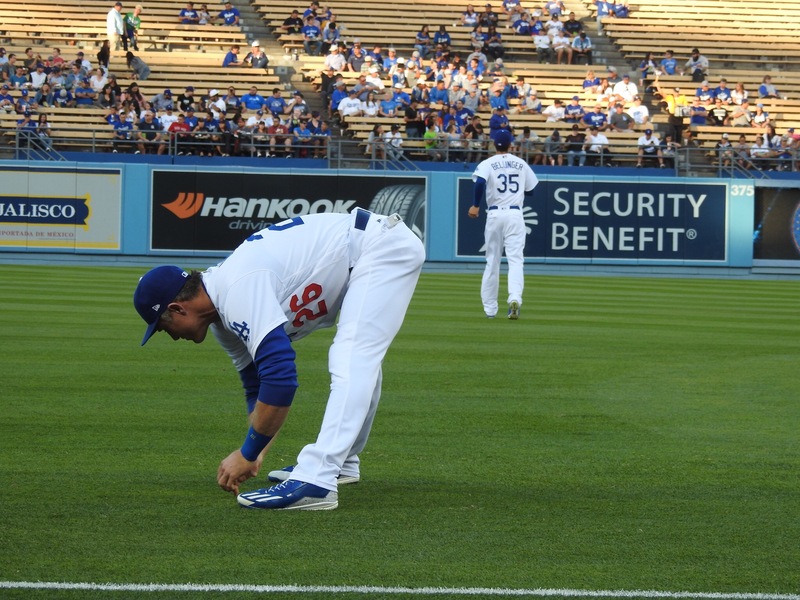 The guys were already on the field stretching and tossing the ball. I was a little tired since I had to work the night before. Day game Sunday and then 12 hour shift right afterwards does not make me very energetic the next day. 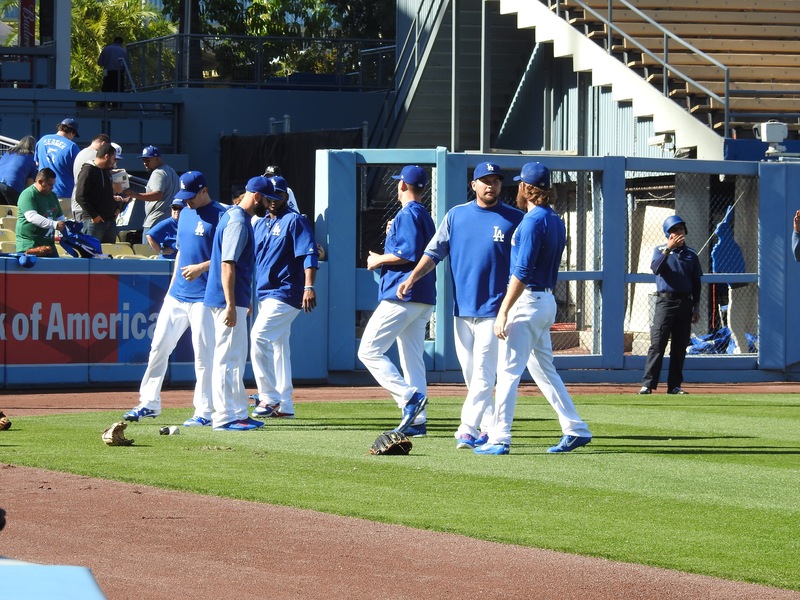 I was surprised to see Josh Fields back with the team considering he had been DFA’d just a day before. 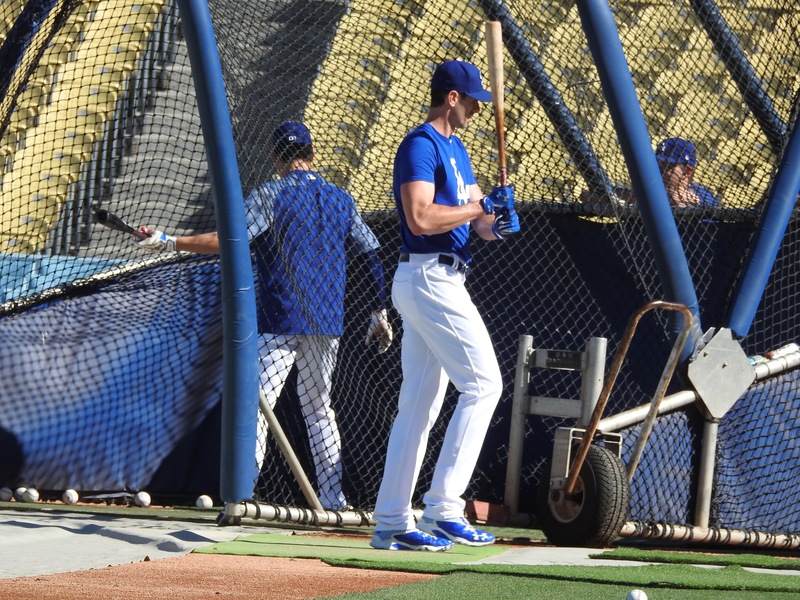 Brandon McCarthy was taking a few swings. Interesting. 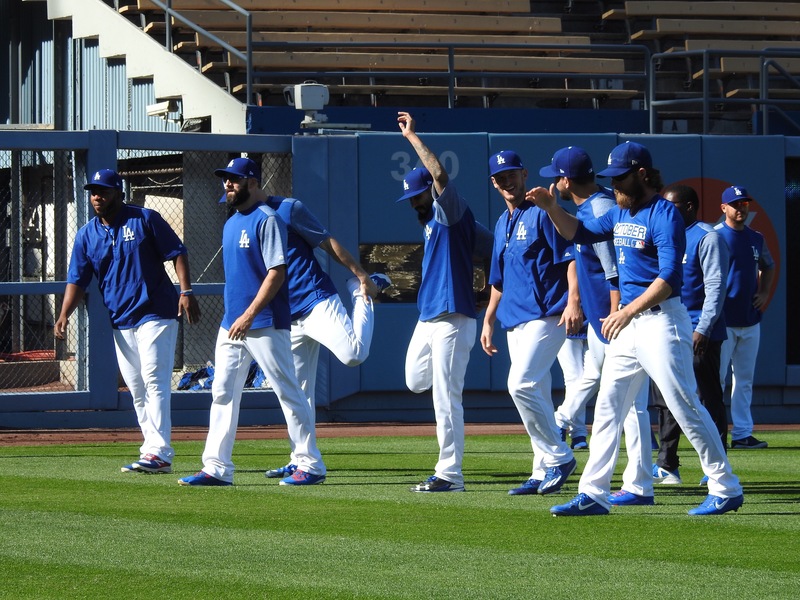 The pitchers were going through some running drills. 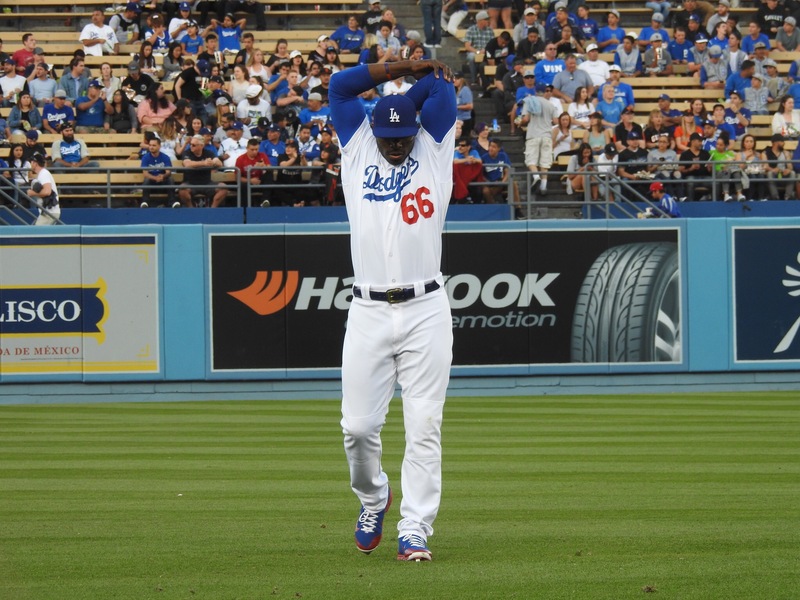 Kenley playing a little peek a boo. A few words with Andre. 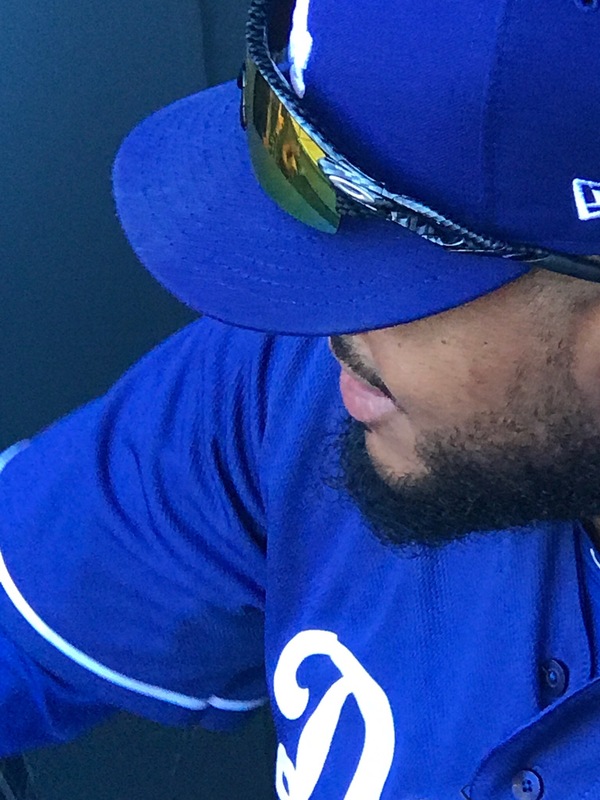 Kenley and Andre are wearing the same type of sunglasses. I have the same ones: Oakleys with a special prizm lens. They probably got theirs free. 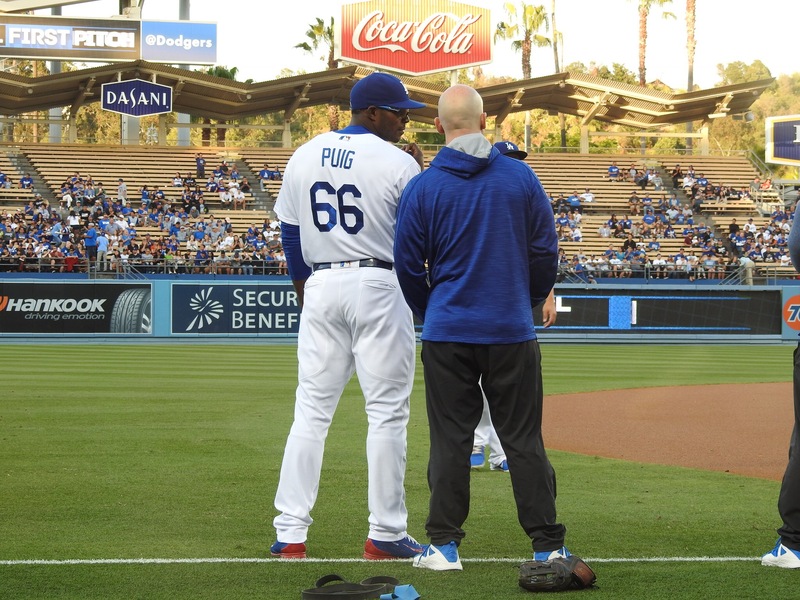 It was time to make my way to the Dugout Club for the first time. I hadn’t been there for a couple of years. I didn’t expect too many changes. I found a table I liked. The server came up to me and asked me to move to a smaller table since it was getting crowded. Guess who didn’t get a tip. Rude doesn’t deserve anything extra from me. Everyone who knows me knows I always tip. This was the exception. The food in Dugout Club is actually the only thing I like about it. I prefer my own heaven: the Baseline Club. It’s what I am familiar with. Everyone knows me in Baseline and would never tell me to move anywhere. Most of them are very respectful, calling me Miss Cat since I have been a fixture of the club for many years.. I did run into some friends there who remember me from my dugout days. It was good to see them. Hugs all around. The food was absolutely amazing as usual. 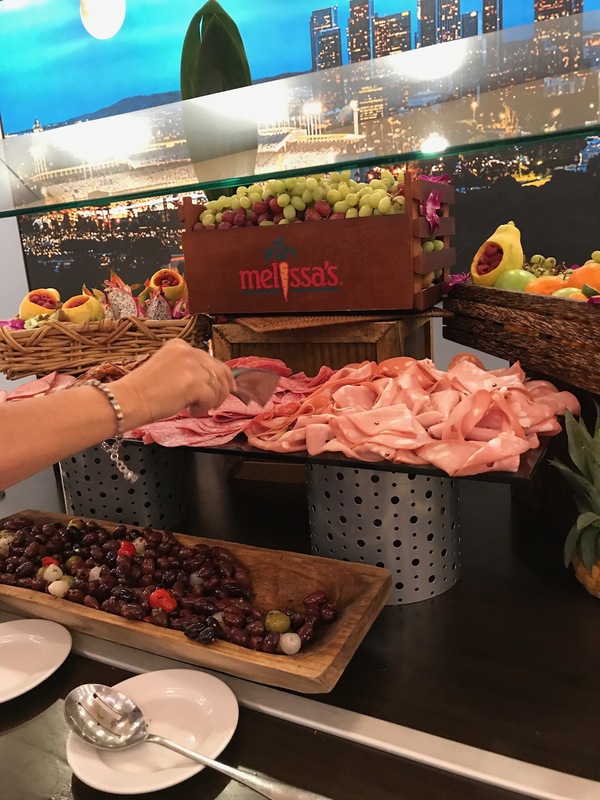 Even the cold cuts looked good. One good thing about moving to a smaller table was that a nice family with visitors from Japan sat at the larger table. I must have been brain dead because I didn’t take a picture. I had a ball in my backpack so I gave it to one of the visitors. He looked at it like it was a treasure. My one regret is that it didn’t have any autographs on it. 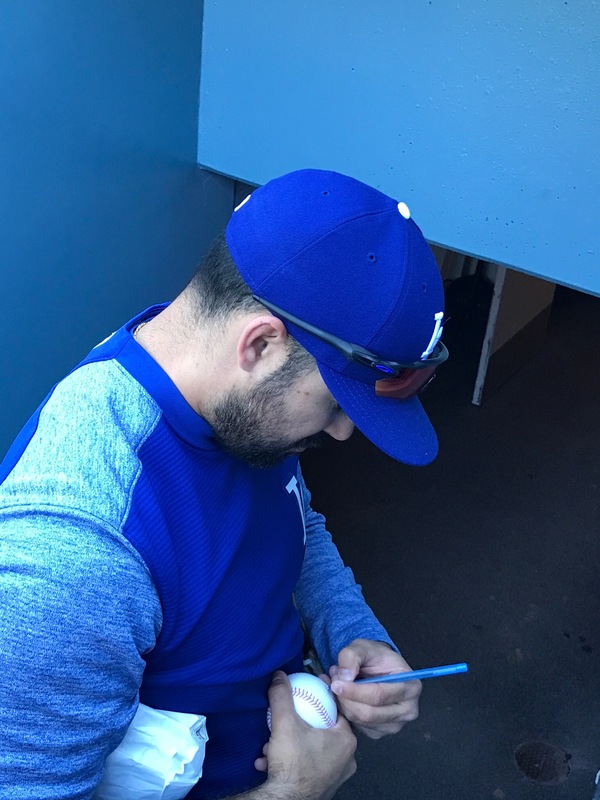 I had a ball that had autographs but the autographs were only special to me: Logan Forsythe, Franklin Gutierrez and Chris Woodward, the adorable border on most of my pictures since he is the 3rd base coach and blocks my view of the players most of the time. It is his back you usually see. The other ball had some autographs but I wasn’t sure whose they were. 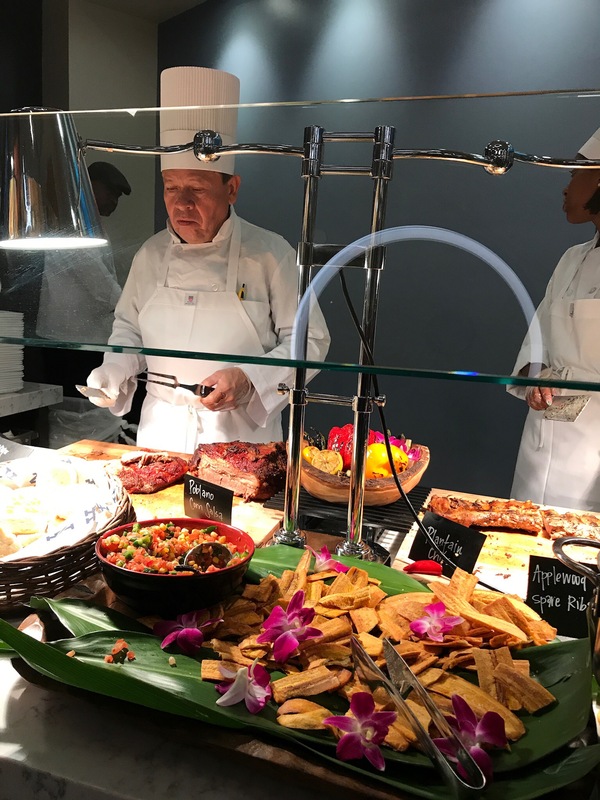 The carving table featured BBQ ribs and roast beef. Both were delicious. The chef on the left gave me two paper thin slices of roast beef. He didn’t get the memo that I eat enough for about 5 people. I went back for seconds and absolutely know he didn’t turn up his nose at me. 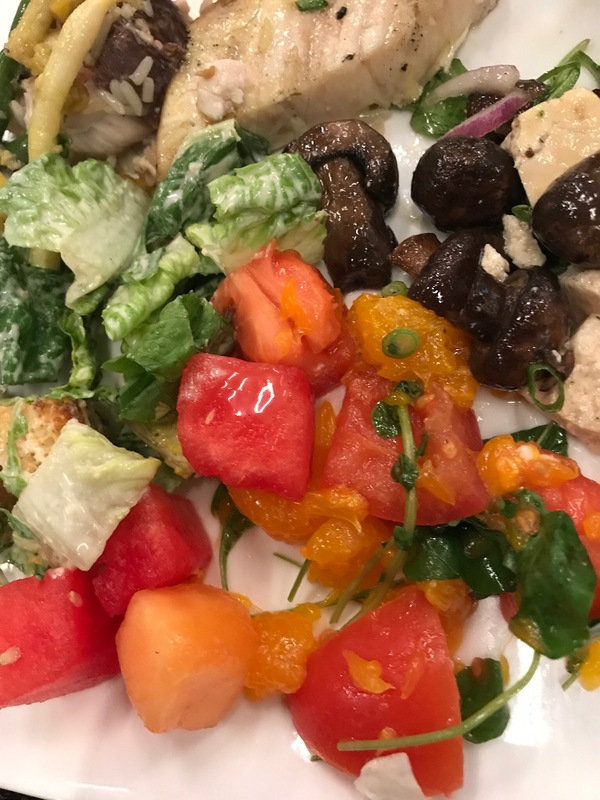 In the top picture are the salads with swordfish in the upper right corner. “The best I’ve ever had. 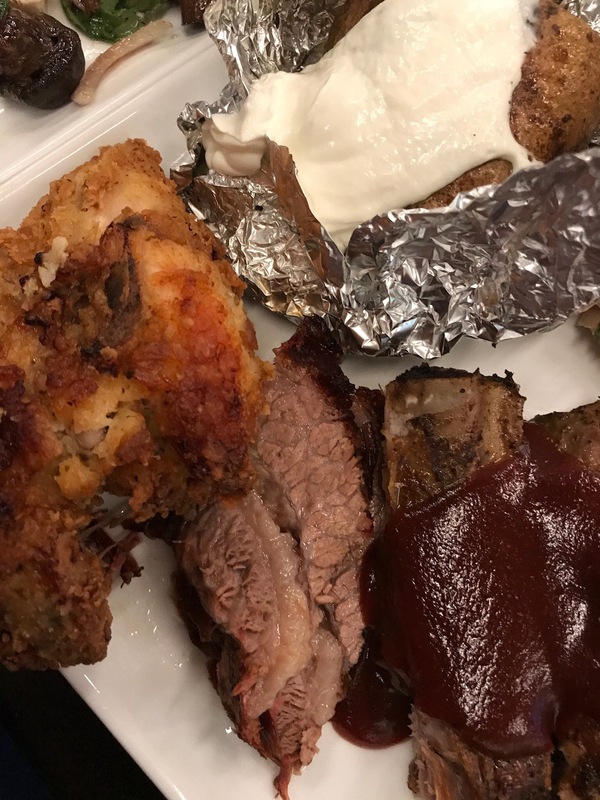 The picture directly above features the ribs, buttermilk fried chicken and the melt-in-your mouth roast beef, not to forget the foil wrapped baked potato. I would have been happy with just that baked potato topped with butter and sour cream. 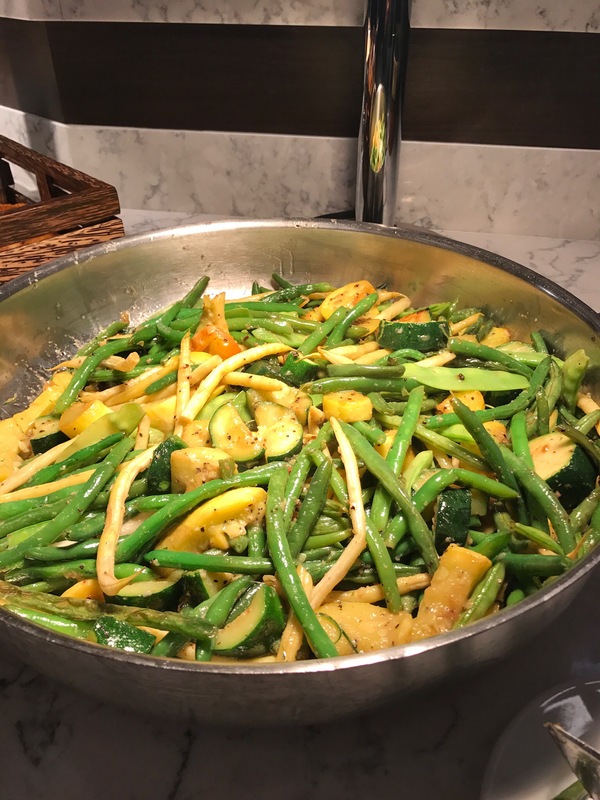 I reluctantly left that fantastic spread of food to go back to my usual routine. 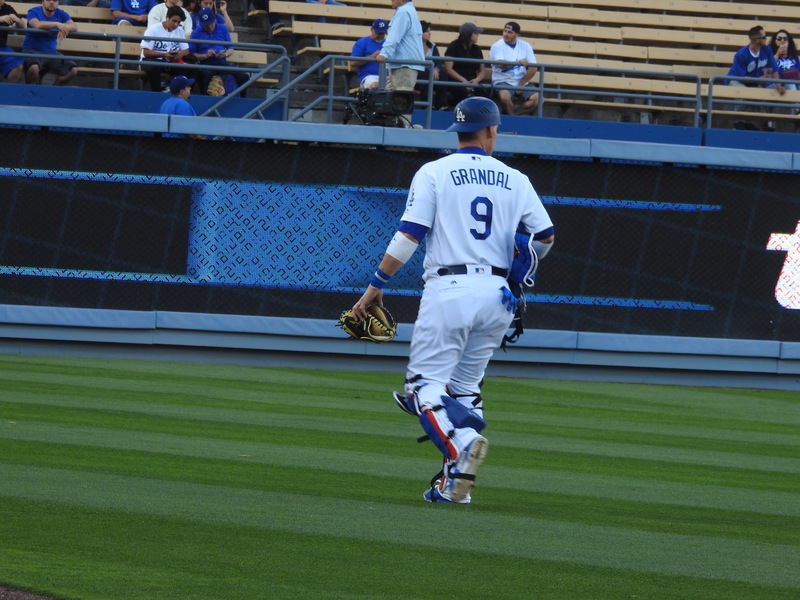 I arrived just in time to see Yasmani Grandal walking down the field. He never looks anywhere except straight ahead. 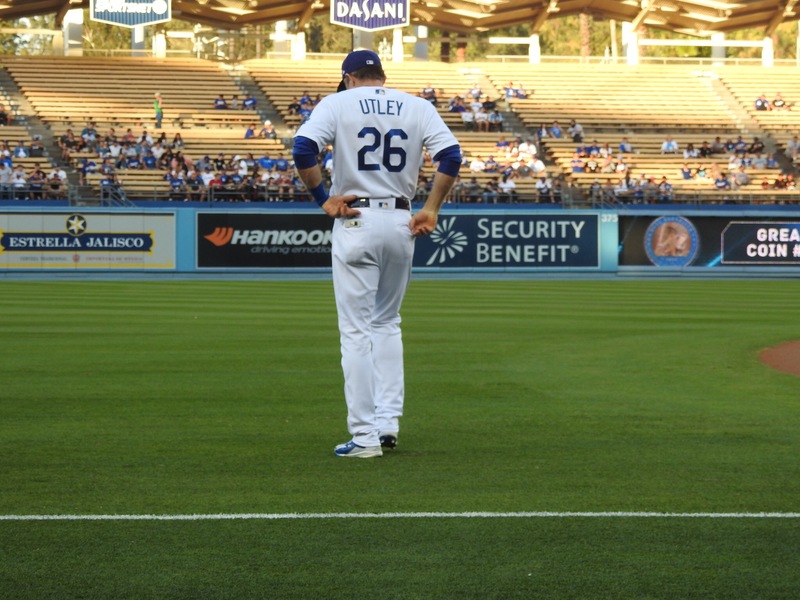 All business that Yaz. 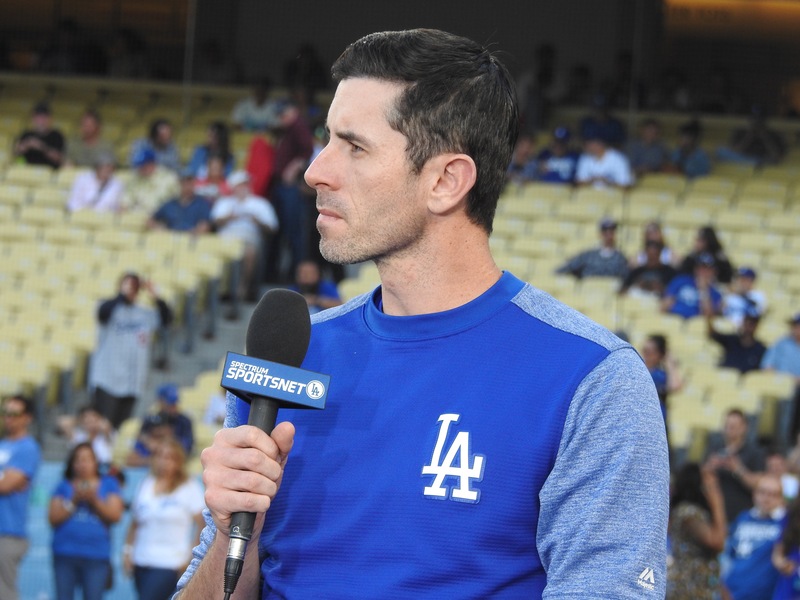 Brandon McCarthy was being interviewed by Sportsnet. I love Brandon. 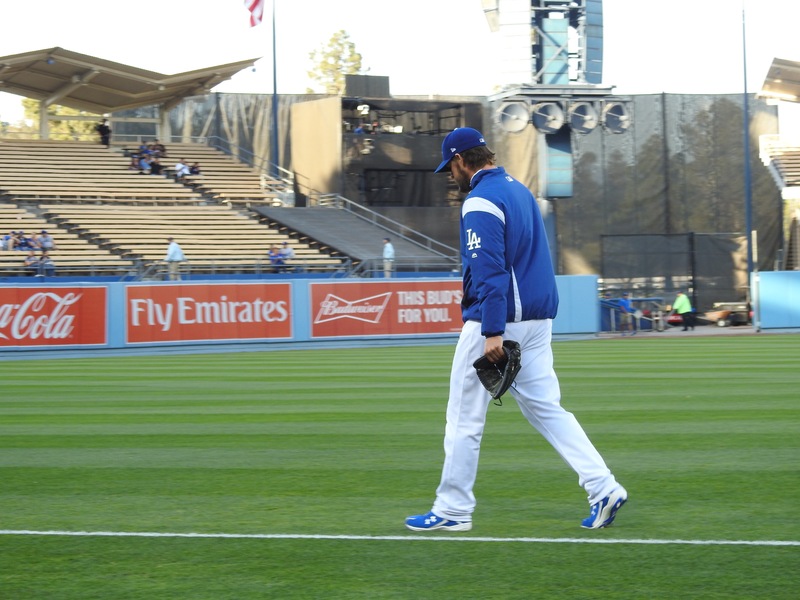 Then our ace Clayton Kershaw made his trek across the field. He seemed to be in his own little world. 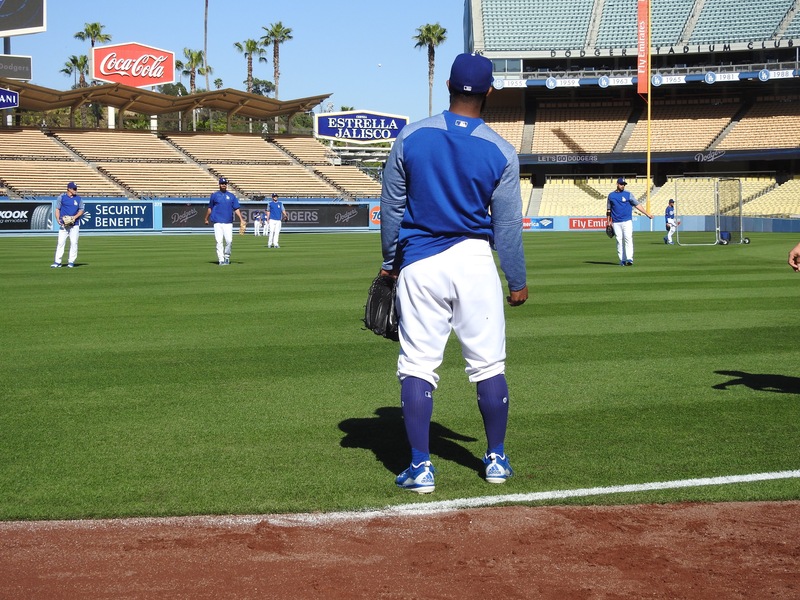 Everyone is aware that Clayton has his own routine. 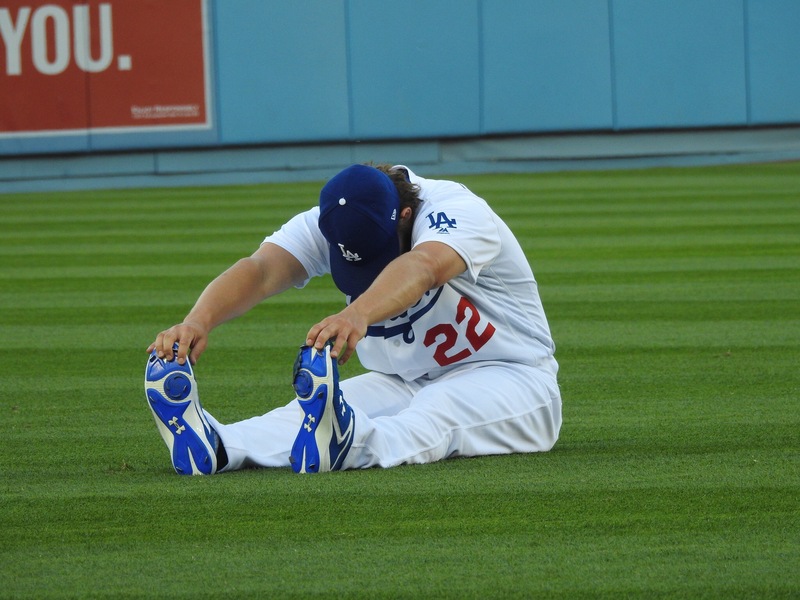 He did his usual stretching. 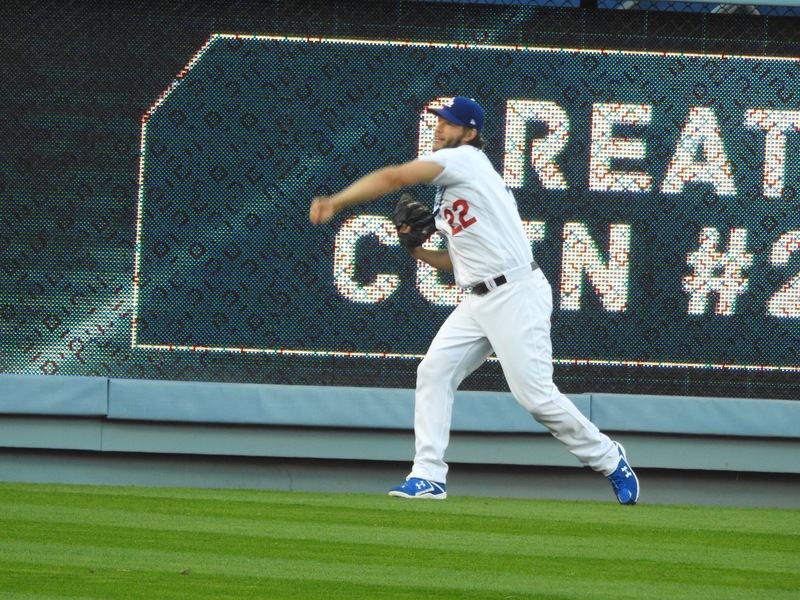 He warmed up. 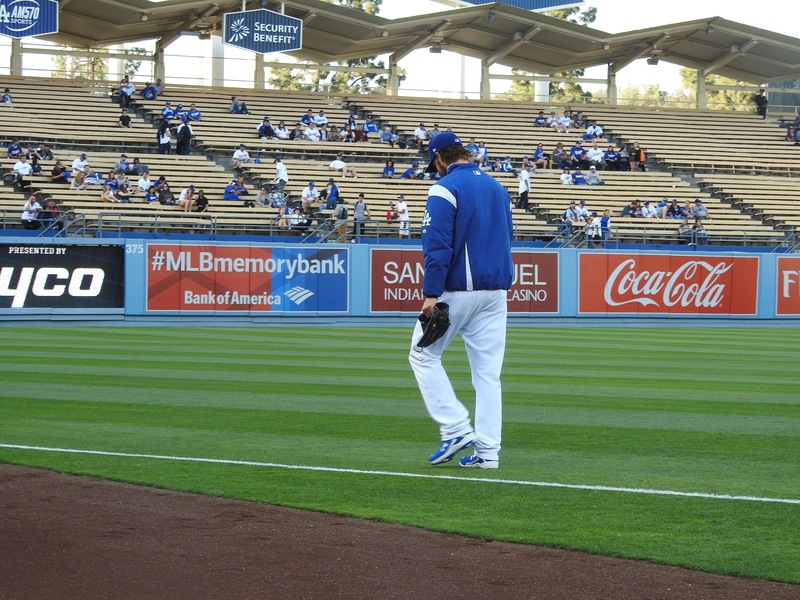 I’m sure he throws the same number of balls from the same spot every time he warms up. 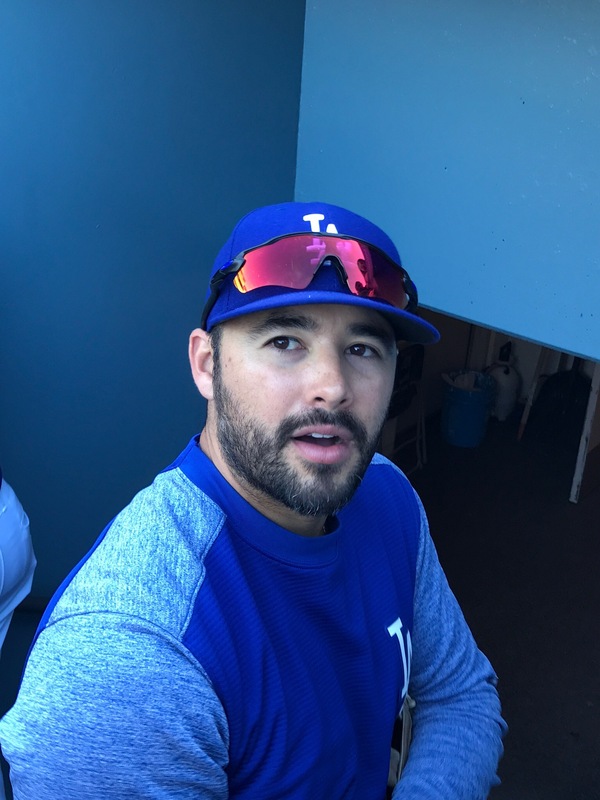 Last outing for him, he was angry at the opposing pitcher for disrespecting him when the game didn’t start at exactly 7:10. 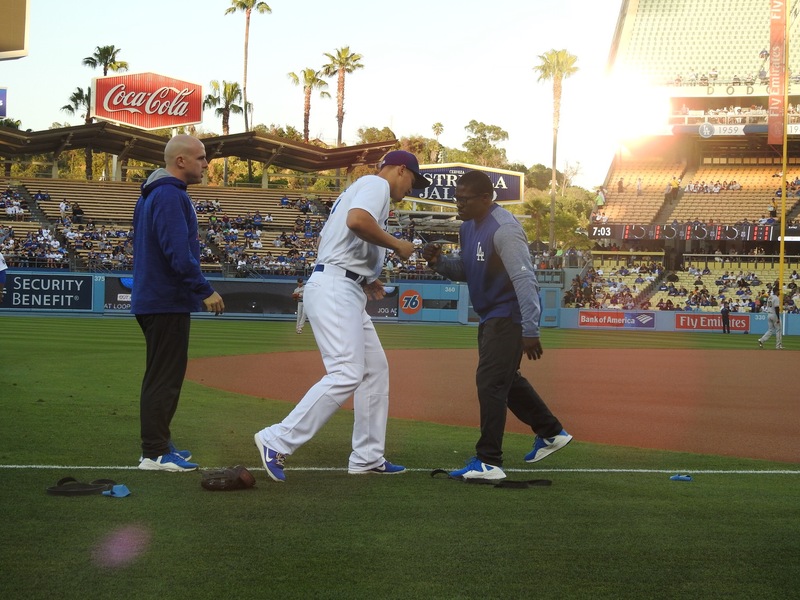 That pitcher had walked on the field as Clayton was ready to throw the first pitch. 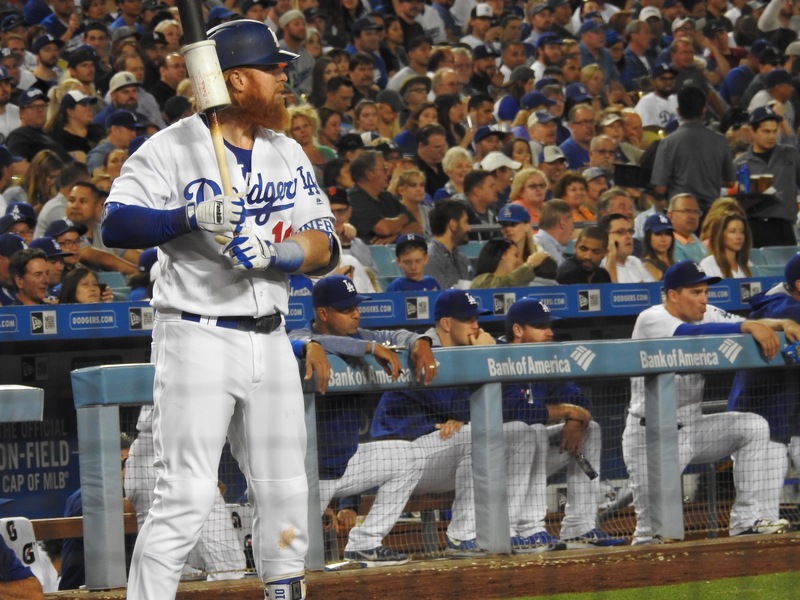 It threw off his timing that game but the Dodgers were able to pull off a win anyway. 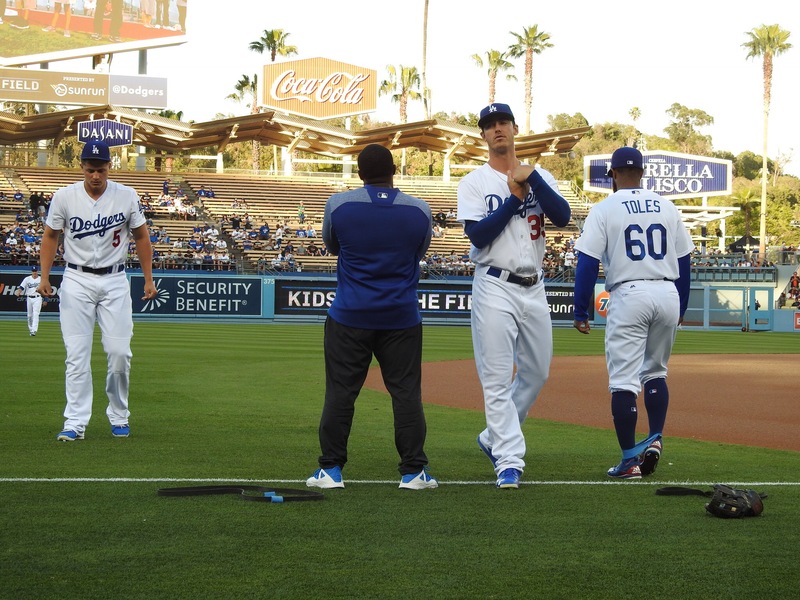 The others came out to warm up, Chase always being the first. 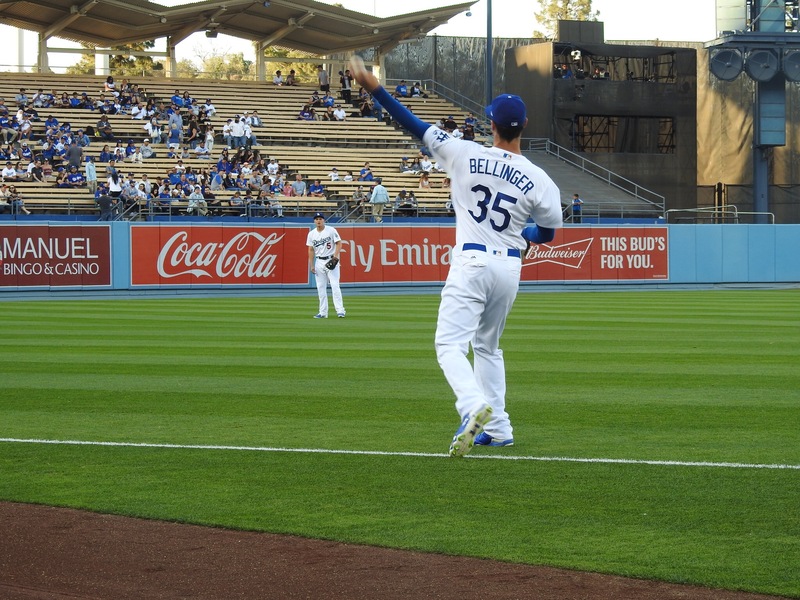 I think Cody Belinger has figured out that I will be there every game taking pictures. 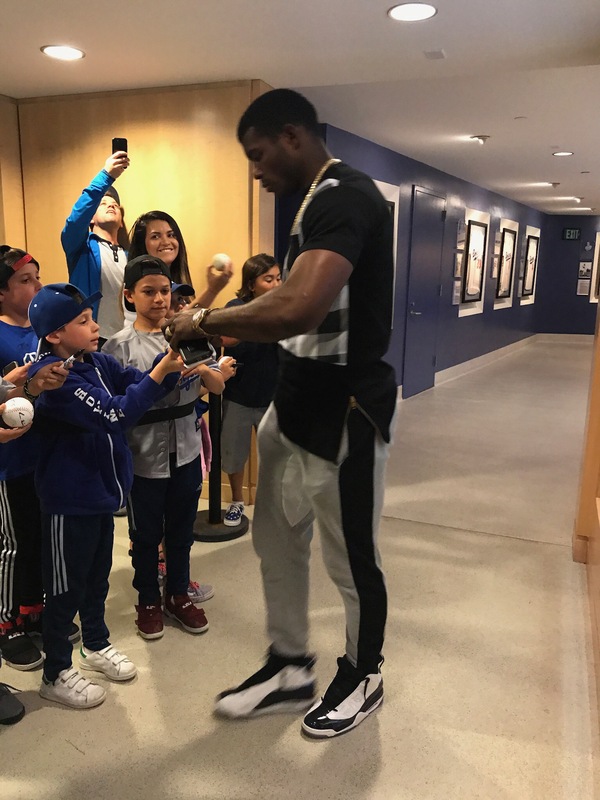 No one knows why he has not signed one autograph since coming up from Triple A. 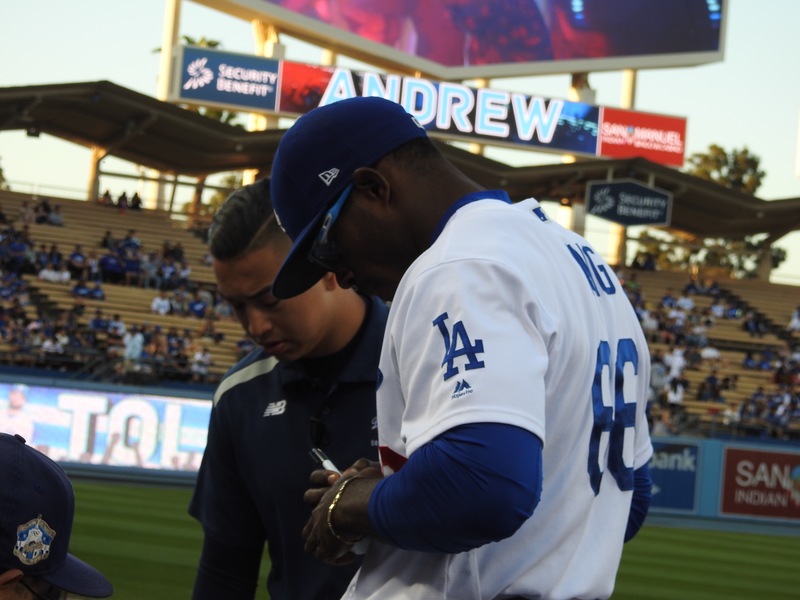 We know why Andrew doesn’t sign much….he’s very quiet. Maybe Cody has a contract with a card shop. 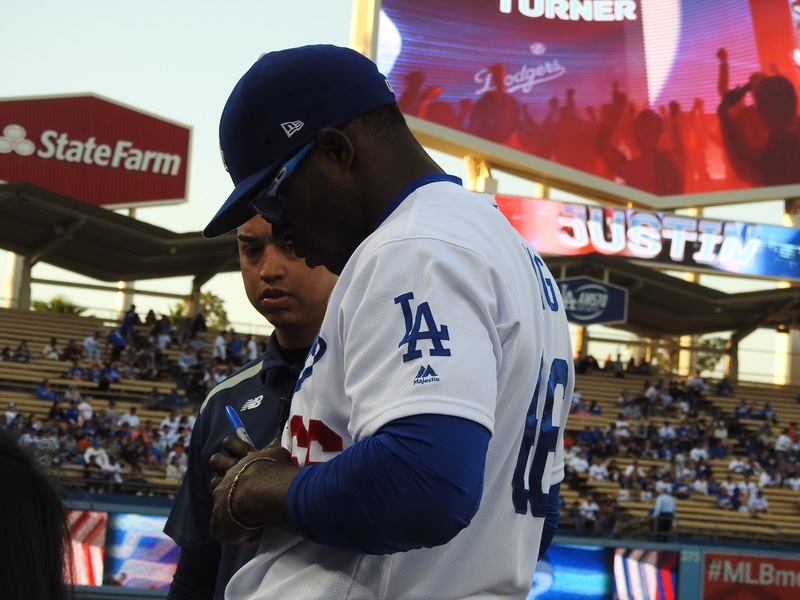 Corey, however, signs every game and always has. His mom did a great job raising such a gentle soul. 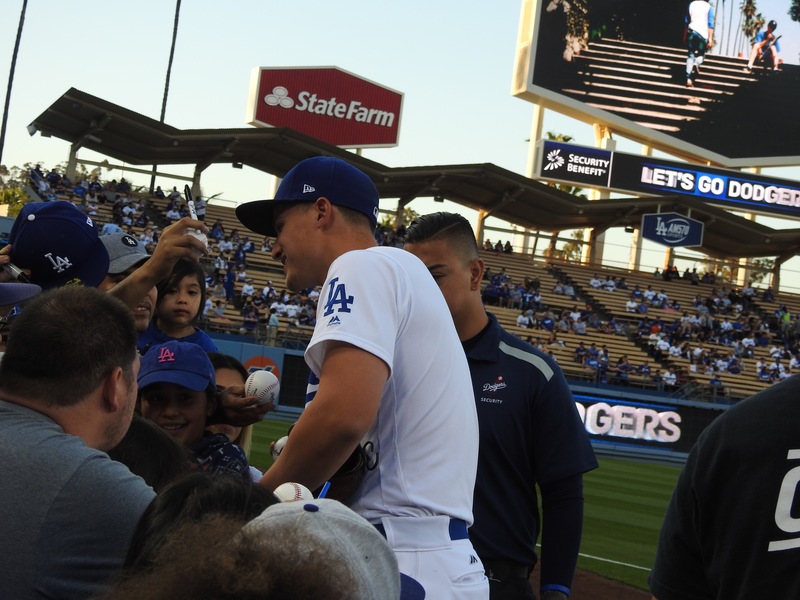 Everyone loves Corey. 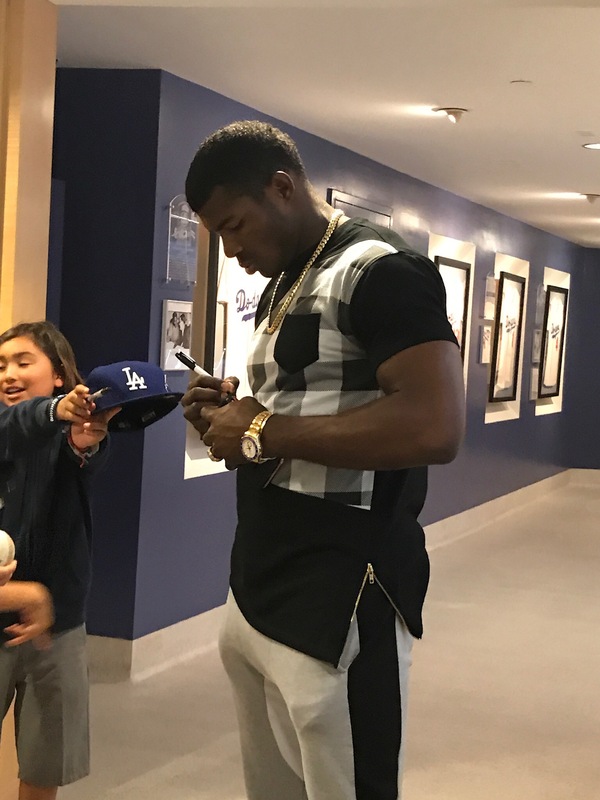 Yasiel is also every child’s favorite. 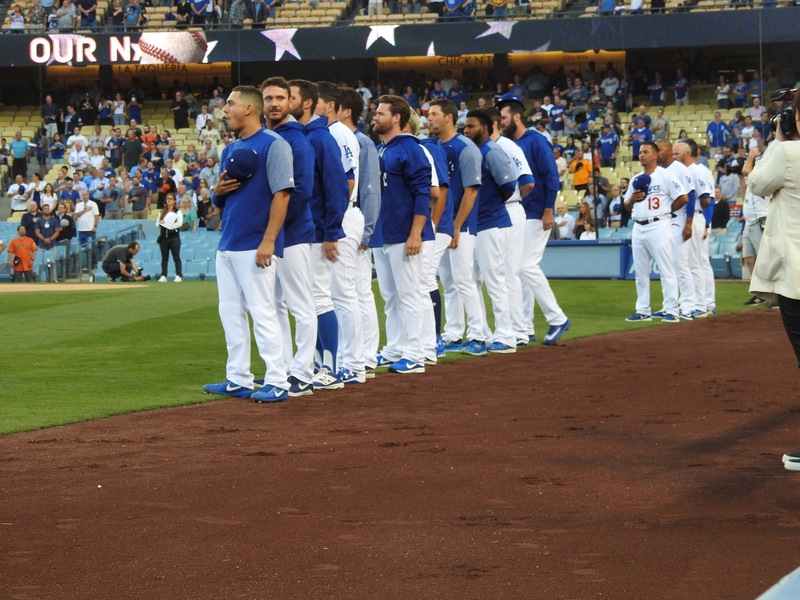 National Anthem time. I’m waiting for Norma to arrive. She is my plus one for the Dugout Club. She usually comes from work. Her pet hospital Bay Cities Pet Hospital is always very busy because it is a fantastic place to bring your sick or injured pets. Norma is the best veterinarian I’ve ever come across. Animals adore her and she adores them back. 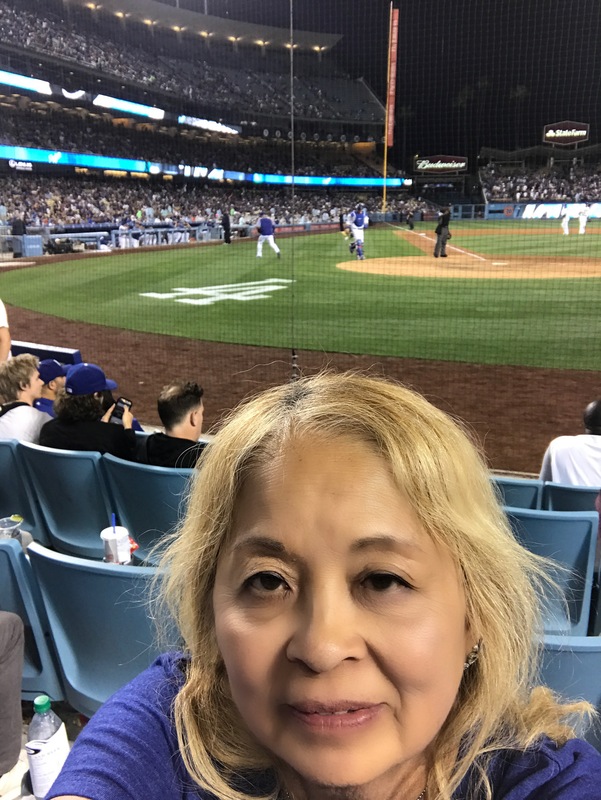 She is lucky to make it to the game by the 3rd inning if she is working She promised to leave early on Monday however because it was a special day. 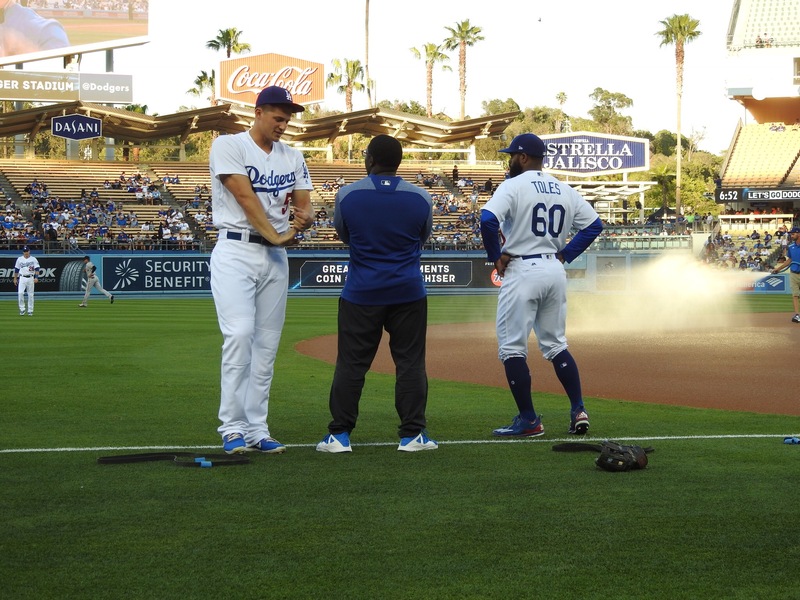 Yasiel who can be very silly, surprised one of the trainers by crawling through his legs. 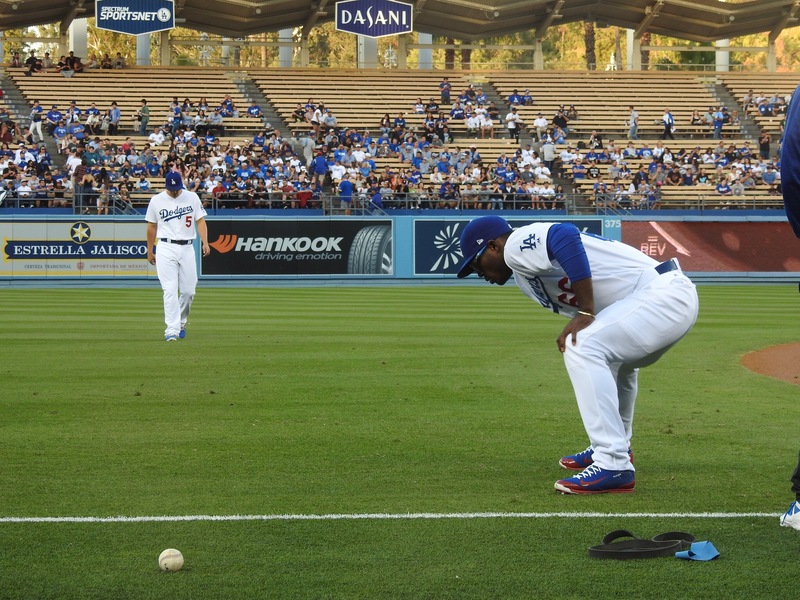 Never let your guard up around Yasiel. 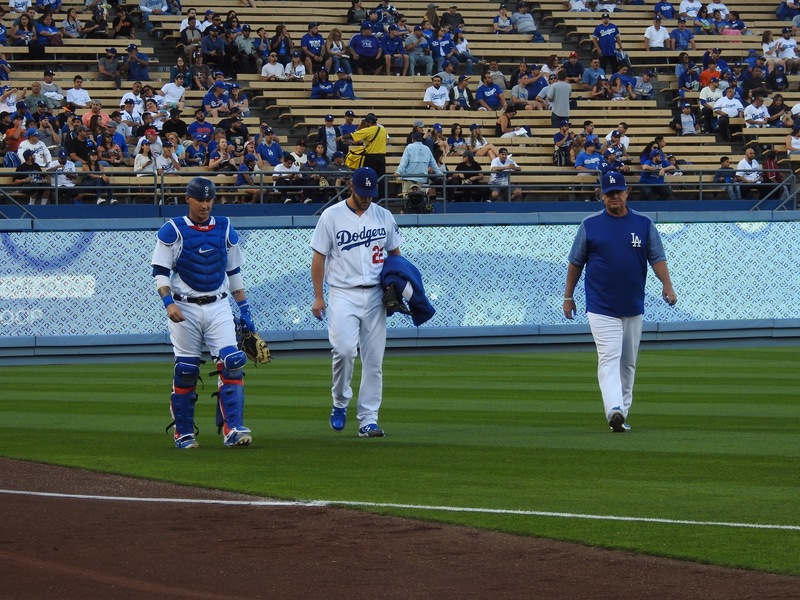 Clayton and Yaz made their way across the field. Hi Robert!! And the game was about to start. I thought I would go to my baseline seat just so it wouldn’t get lonely. 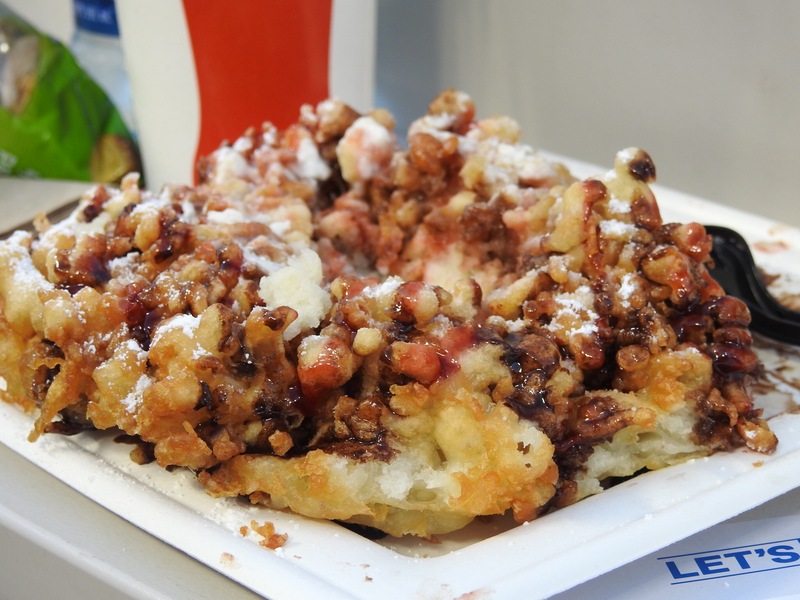 The person sitting next to me had one of the amazing desserts featured on field level: the funnel cake. Wow!! All I know is that this game better start at exactly 7:10. First pitch right on time. 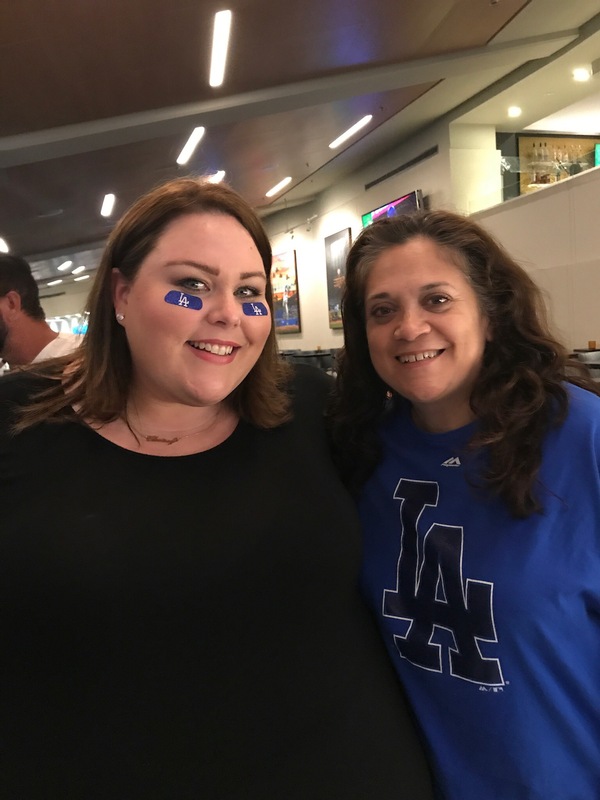 Norma texted me that she had arrived so we met at the Dugout Club. She was hungry so I sat and ate with her. The server said to me “Oh, back again?” I’m really glad I didn’t tip him. JERK!! 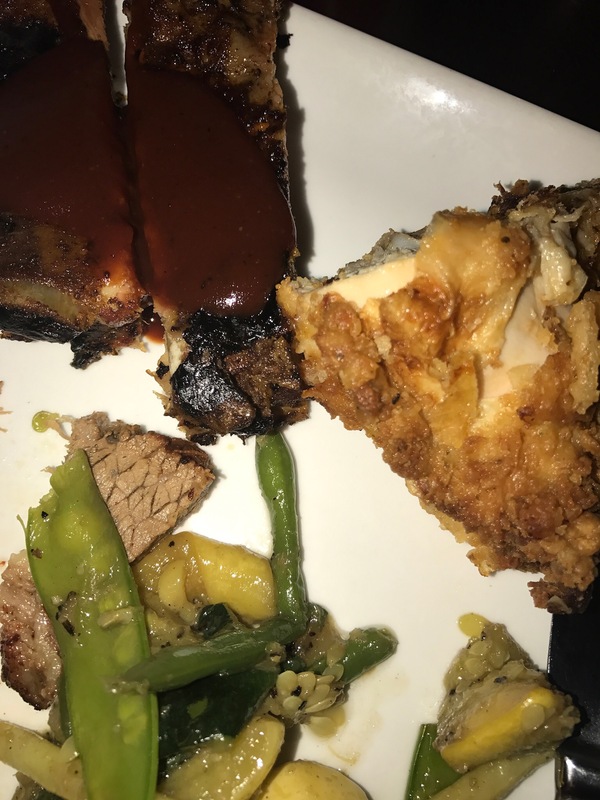 My second helping: some more roast beef, ribs and chicken. 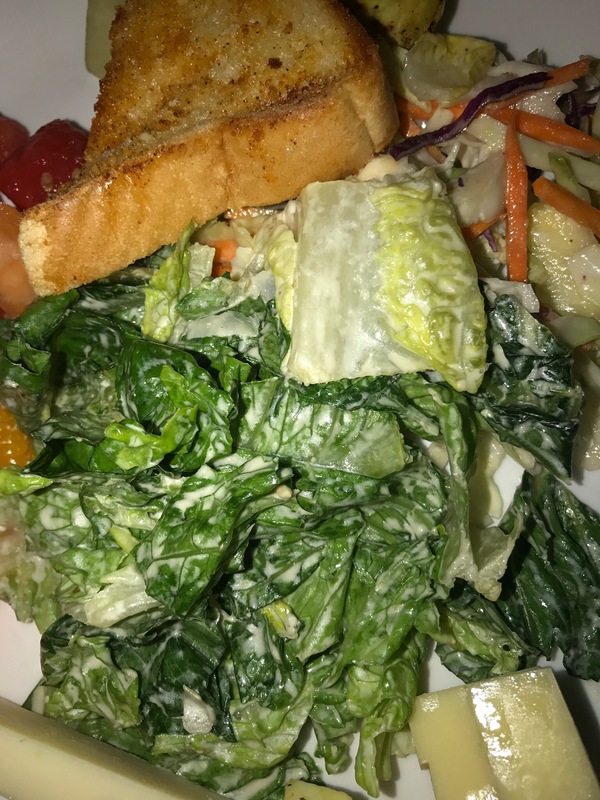 I also had some Caesar salad and Cole slaw. The garlic bread was crunchy and savory. 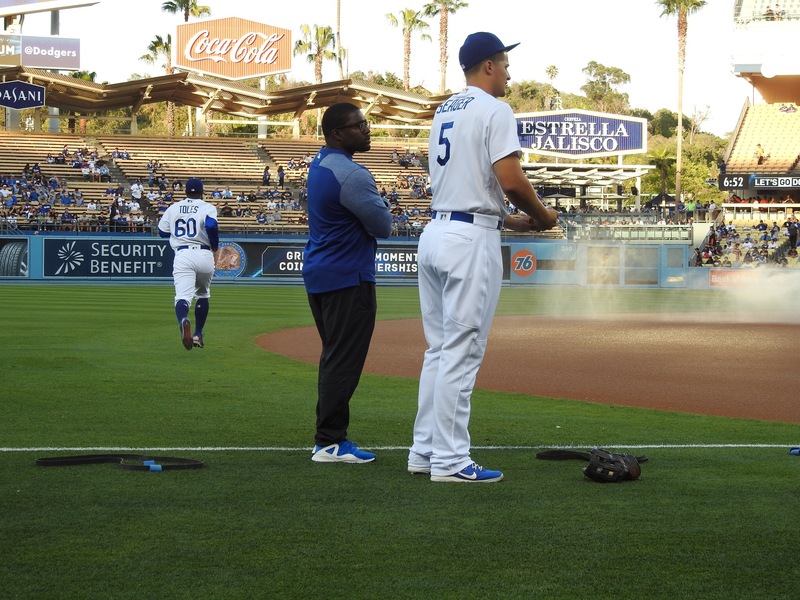 Here is the view from my dugout seat. Pretty amazing, don’t you think. I definitely look like I haven’t slept in a couple of days. My buddy Norma with a couple of photo bombers in the background. Giants fans!! EEK! I tried to take pictures but the screen that separated the special people in dugout section and the field destroyed any photo opportunities. I gave up. 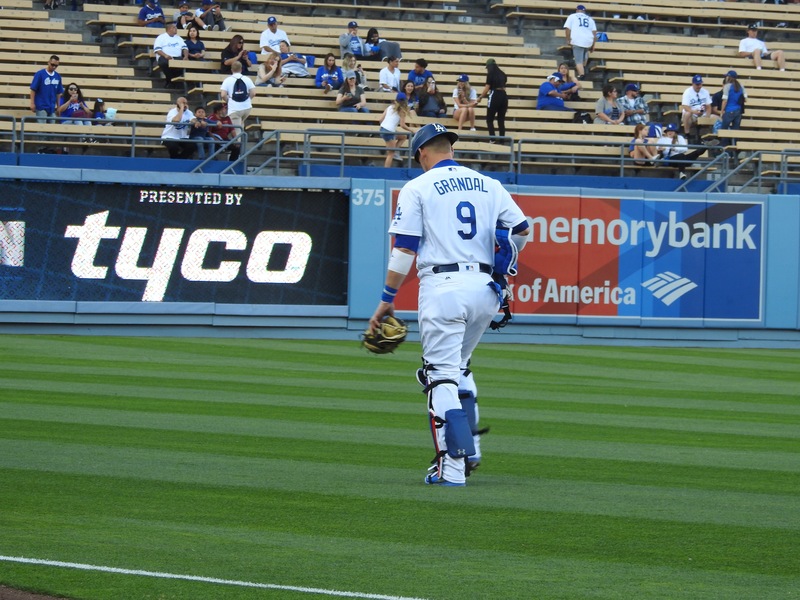 My camera seems to think that I want to take pictures of the screen and that the Dodgers are just the background. I need to get a smart camera to go with my smart phone. I started to get a little distracted. Dugout Club can do that to a person. Norma said she saw Rob Lowe. OK so it was the hunt for Rob Lowe. The game was not going well so it was just as well that my camera was not cooperating. 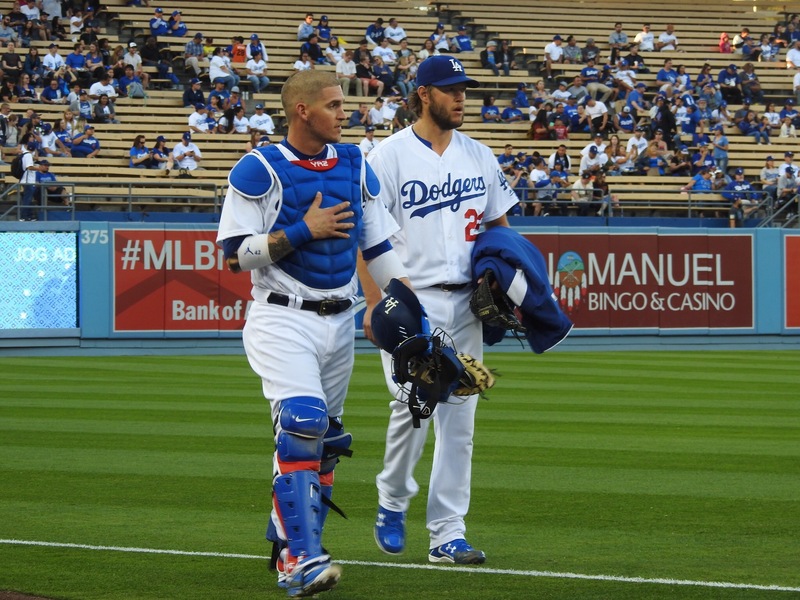 I felt horrible for poor Clayton who was having an UnClayton-like game. Hey folks…he is after all a human being. We went in for dessert. I did a little shopping and bought another Dodgers Dooney and Bourke purse. I fell for the baseball stitching on the handle. Yikes. I have such a weakness for those purses. 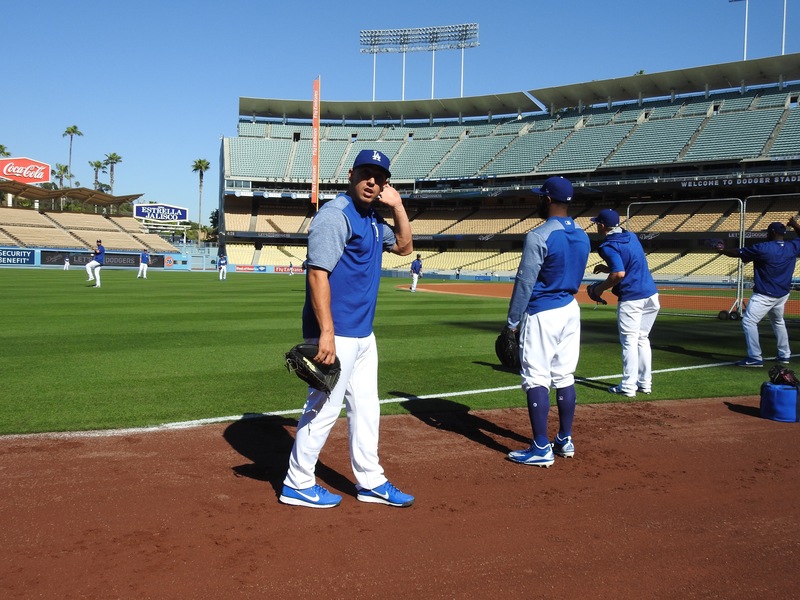 I don’t understand that Dodger Pride card. It worked to win these dugout tickets. 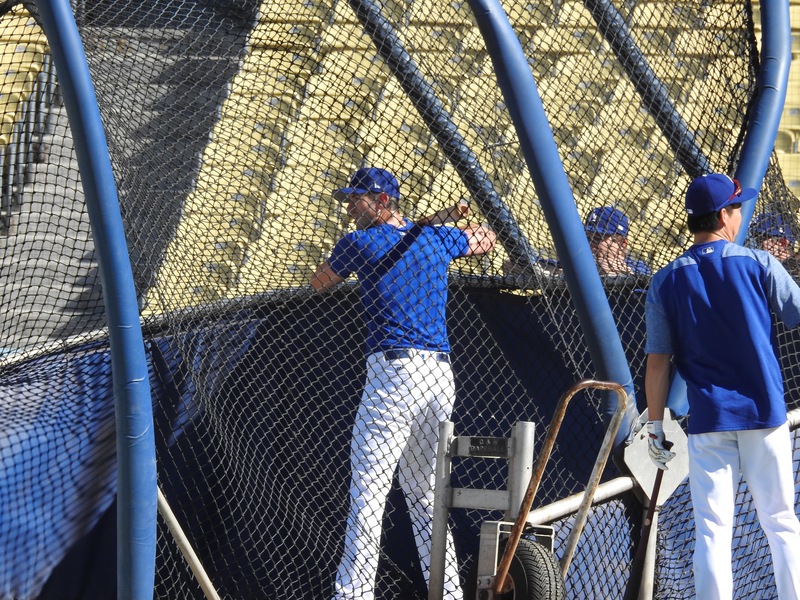 It worked to get into the stadium for early batting practice. But do you think it worked for my shopping. No!! The card gives me a 30 per cent discount on purchases at the stadium. The vendors gave me my discount anyway, probably because I looked like I was going to have a heart attack. Poor Norma was not so lucky. She didn’t look like she was going to pass out so they wouldn’t give her a discount when her card also wouldn’t work. I still get star struck. 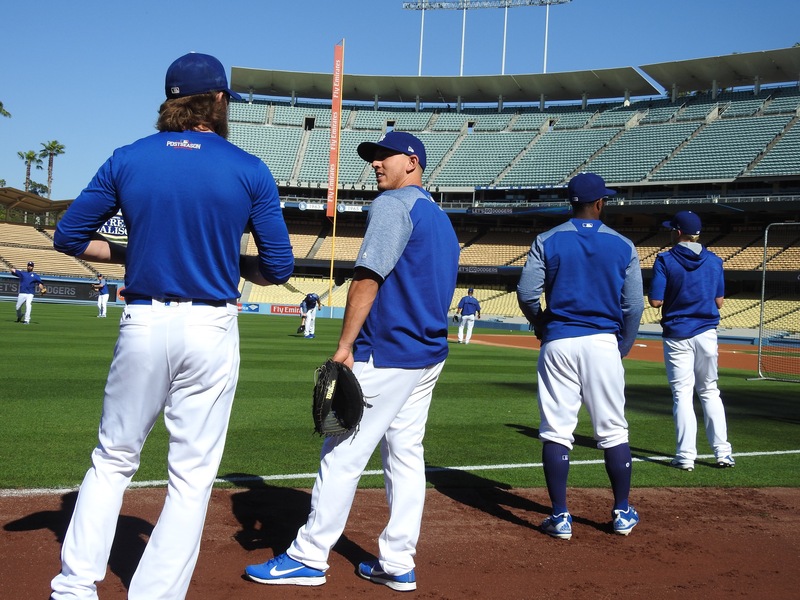 My Dodgers are very familiar to me but they still are my super heroes. They have talents far above and beyond the average person. I don’t try to make friends with them. I don’t ask for favors. I rarely ask for autographs. I only ask for pictures because those will be my memories. I think they understand that. 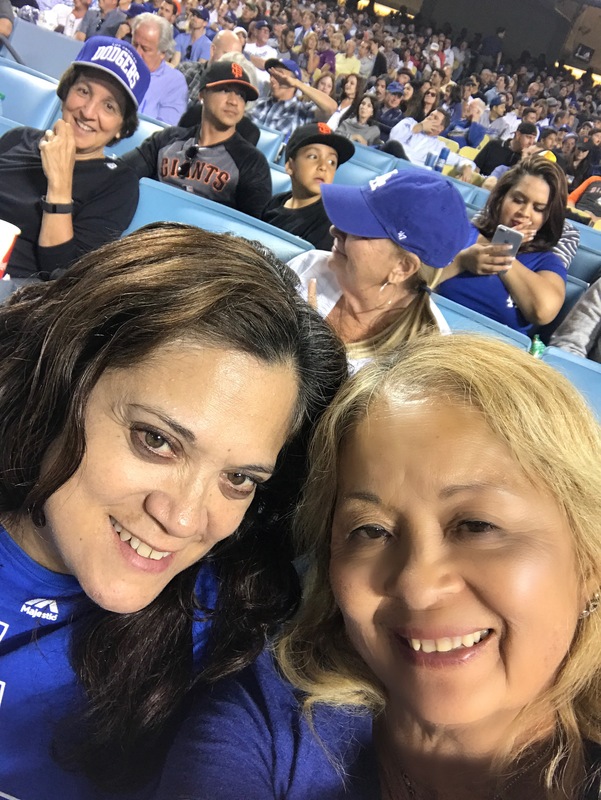 They see me every game so I know they look at me as a loyal fan who is there for the love of baseball and everything it stands for. I bleed blue. 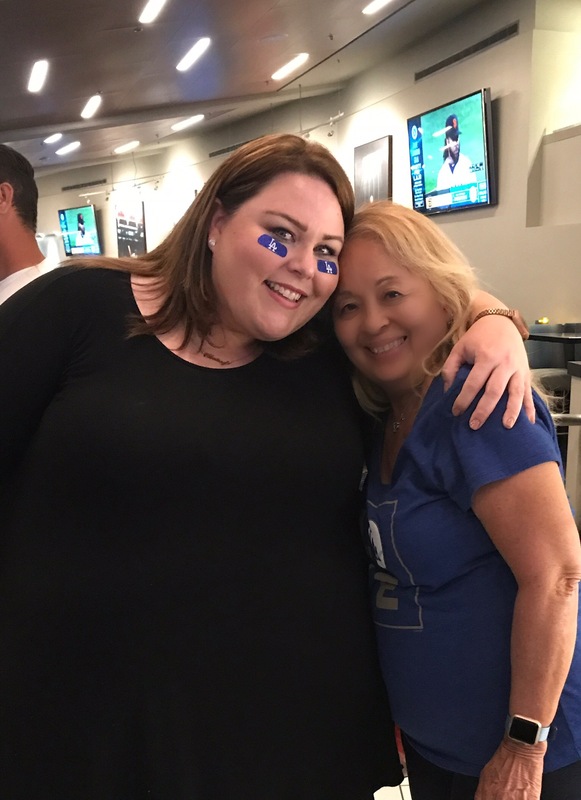 The true highlight of the day was the moment I spotted Chrissy Metz. My favorite show is “This is Us.” It does make me cry because it is a very powerful, well put together show. I usually can’t spot any actor out of context. I saw Chrissy and my knees became weak. I told Norma that I thought it was her. I decided to be brave for this one time and asked her if she was an actress. She smiled at me and I couldn’t believe how wonderful she was. I told her my name and she said “I’m Chrissy,” just like that. “I’m Chrissy.” She is absolutely gorgeous. I blubbered to her that I loved her show. I probably embarrassed my self many times over but she smiled and thanked me and told me I was sweet. She complimented the writers who do a wonderful job creating this amazing show. Everyone should watch this breakout tv show. You can watch season one on Hulu. I may buy the first season on DVD so I can have it permanently…it is that good. It will break your heart many times over. I definitely have to buy it for my sister. The game ended in a win for the evil Giants. 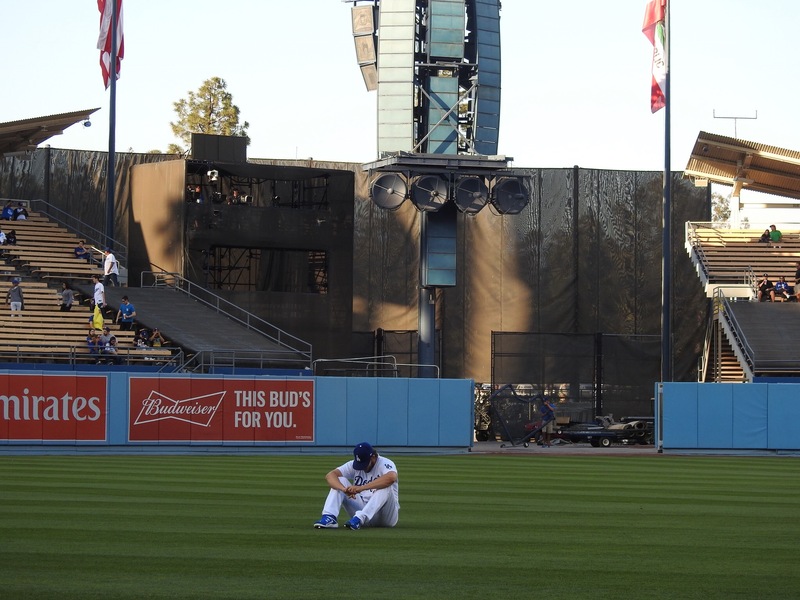 I’m glad I was distracted by the Dugout experience or I would have gone home depressed. 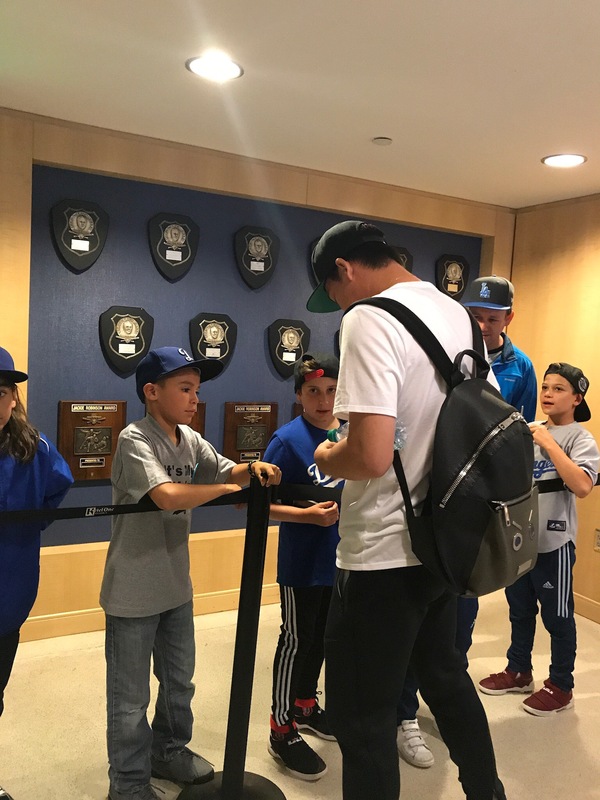 There was one final thing to do before going home…get autographs and pictures as the Dodgers leave. Little did I know that they had changed that whole event by only allowing children the experience. OK, so the Dugout club for all the money you pay has lost my vote. For the money you pay, the food is not worth $500 a ticket. I always enjoyed getting pictures and talking to the players after the game. That was what made the ticket worth it. 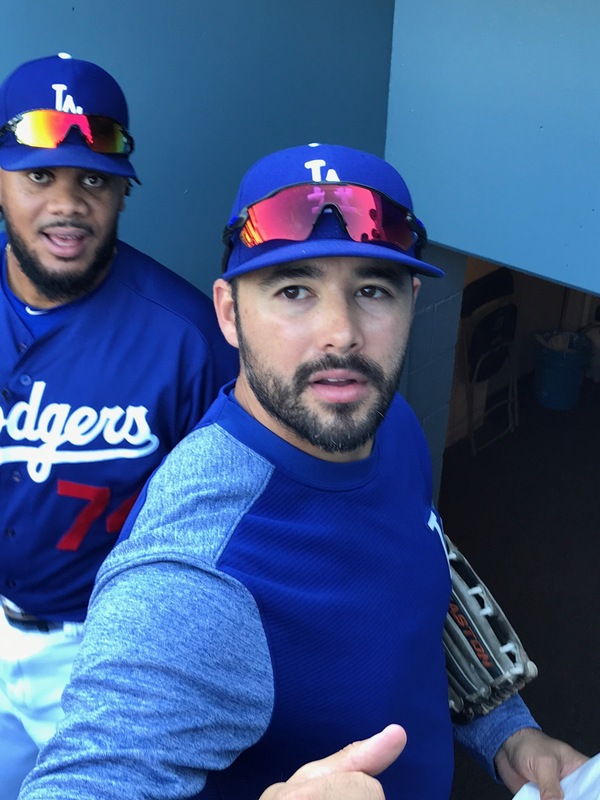 It was those Matt Kemp and Russell Martin days. 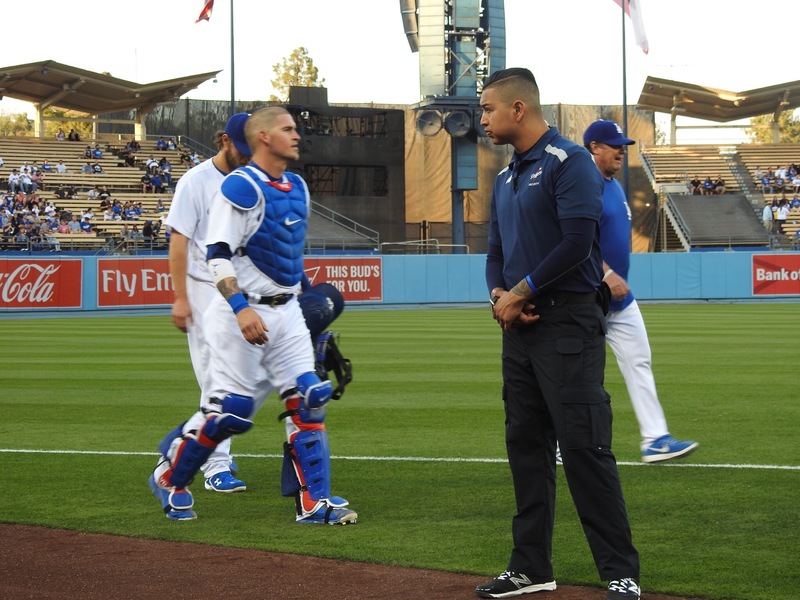 The way it’s set up, the kids are in a roped off corral while the rest of us are either scooted off out the exit or put behind a barrier so the players have their backs to us. I think they are told to ignore us. 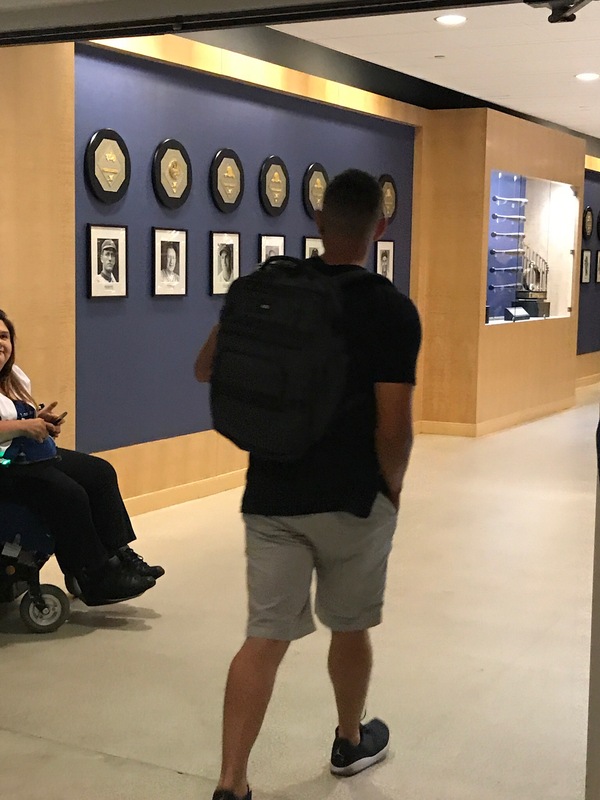 I realized the situation when Andre didn’t even turn around. 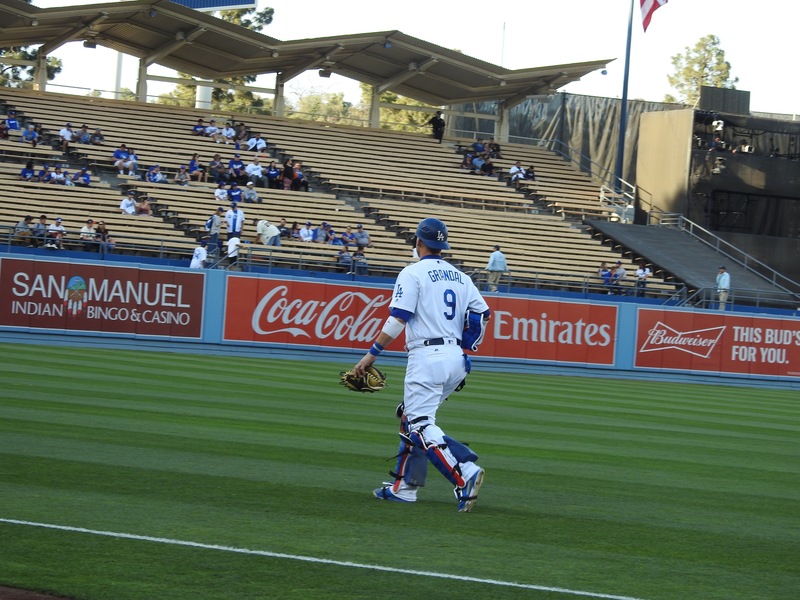 Kenta did turn around and said hi when he recognized my voice. Thank you Kenta. 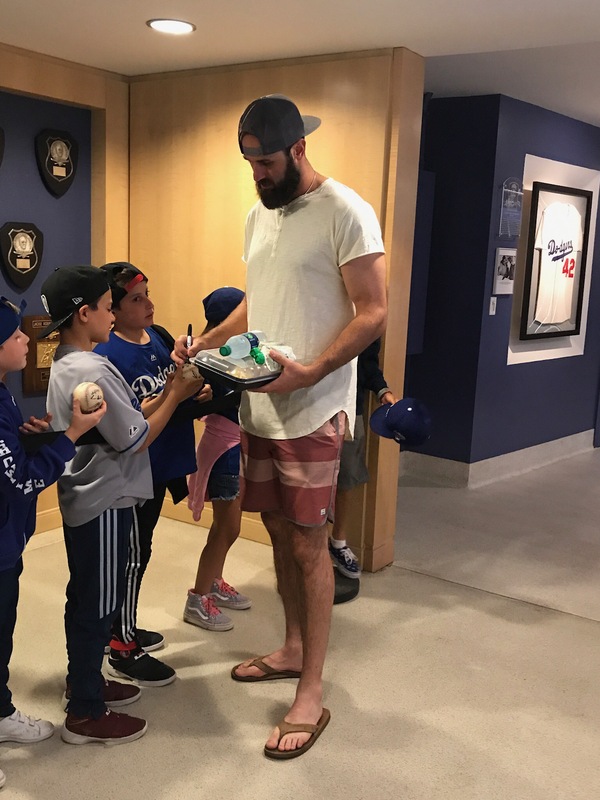 I get the feeling most of these kids had no idea who any of these players were and were getting autographs for their parents anyway. Their parents were allowed to stand with them. I should have brought a kid with me. Austin’s back. 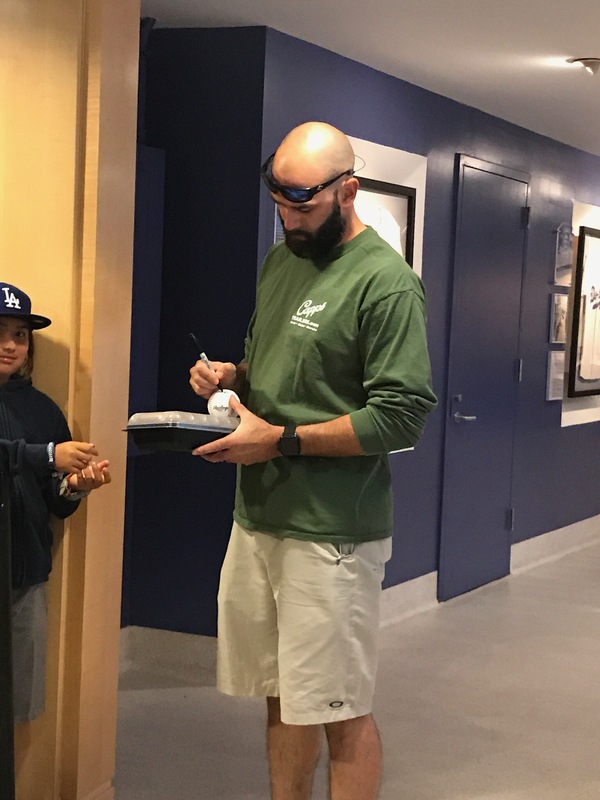 The parents didn’t want his autograph so he was safe. 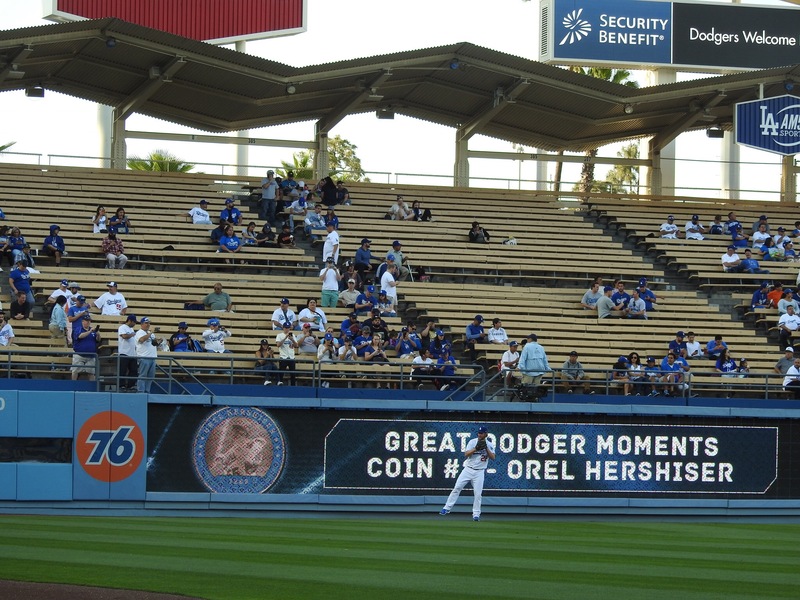 When Yasiel didn’t even acknowledge me, I knew that they were told to ignore everyone except the 6 kids in the corral. 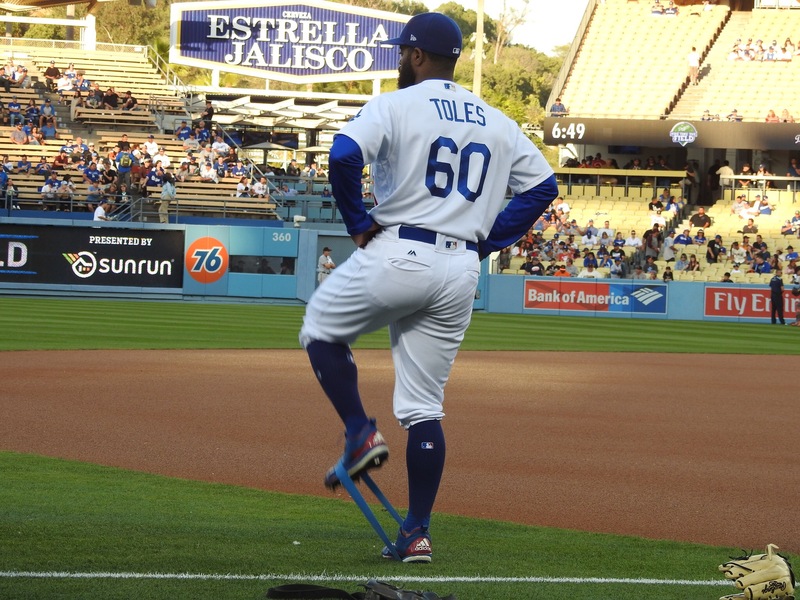 I mean, really Dodger management? 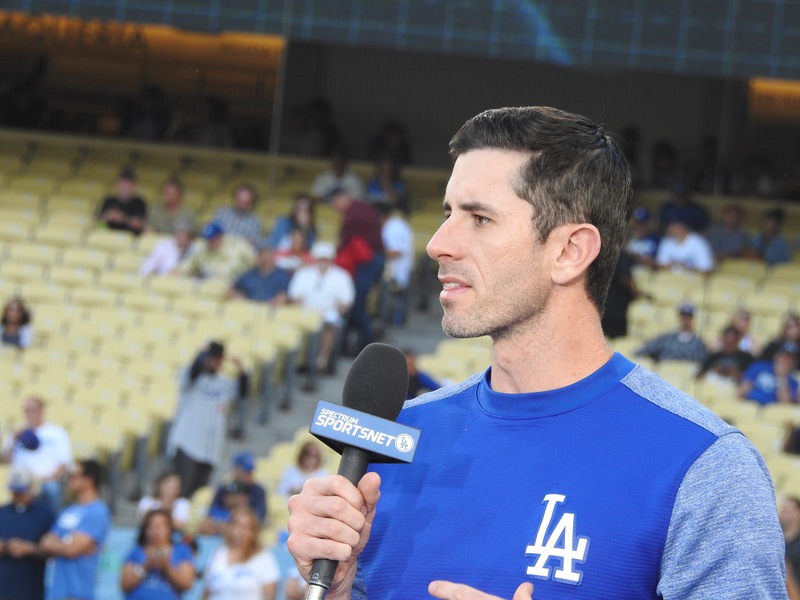 Brandon McCarthy didn’t hear the memo because he gave me a big smile and a hello. 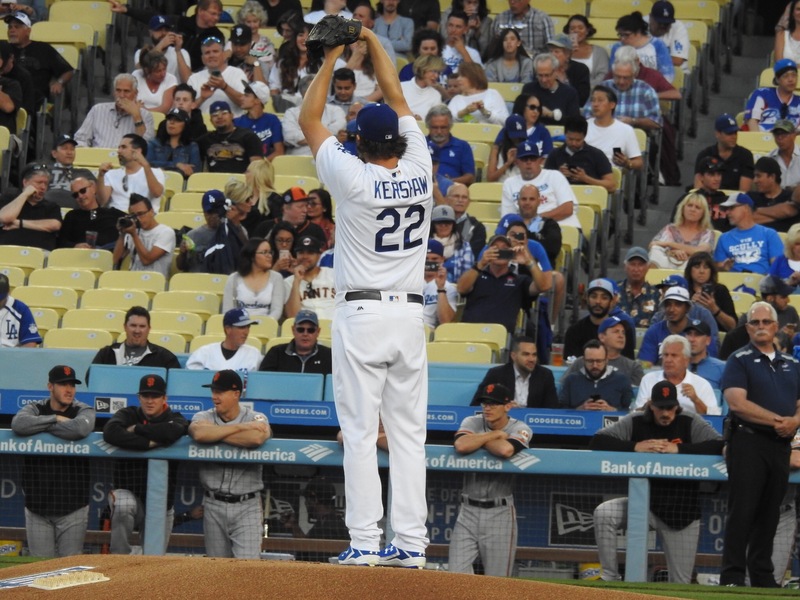 Clayton doesn’t have to listen to any directives because he is after all Clayton Kershaw . He didn’t sign for those kids and parents and said hi to me. 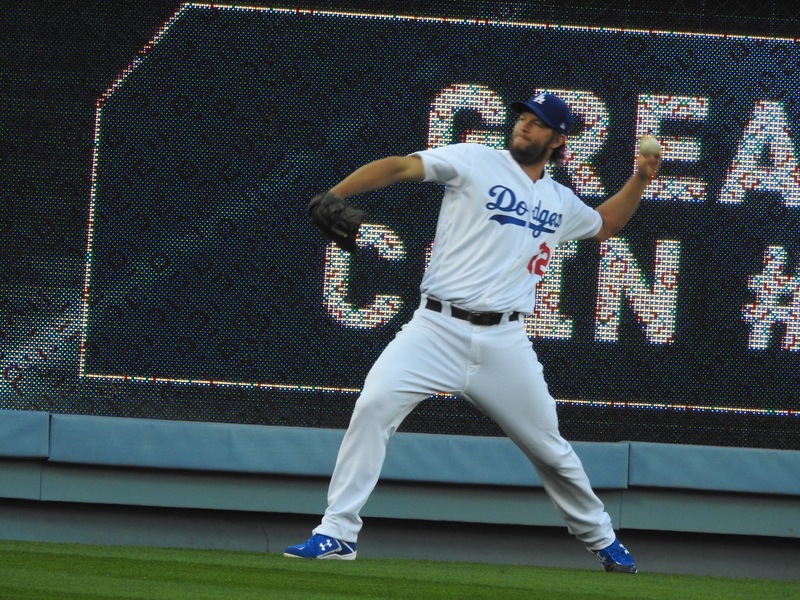 Good for Clayton. He will always be my hero. It was all in all a great experience. 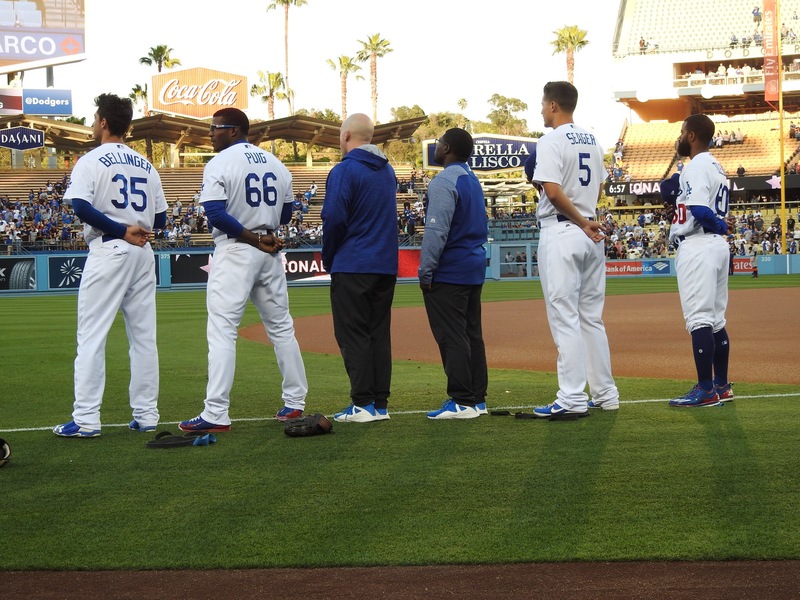 Thank you to the Dodger organization. Thank you Chrissy…you are amazing. Tuesday is a normal day…oops wait a second..it’s Armed Forces Day. I got two tickets for the special tee shirt. It will be a trek to Reserve section which is a county away. 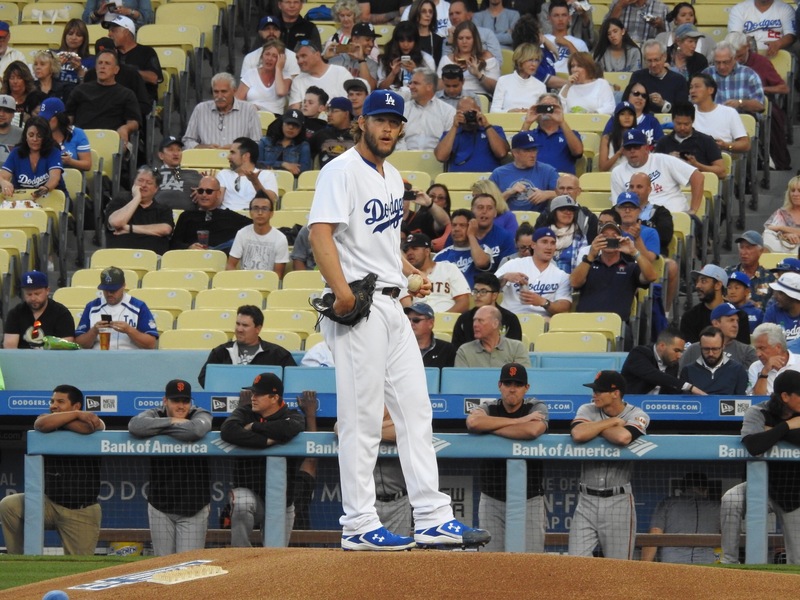 Hopefully Alex Wood and the Dodgers can work some magic. Against a left handed Giant. 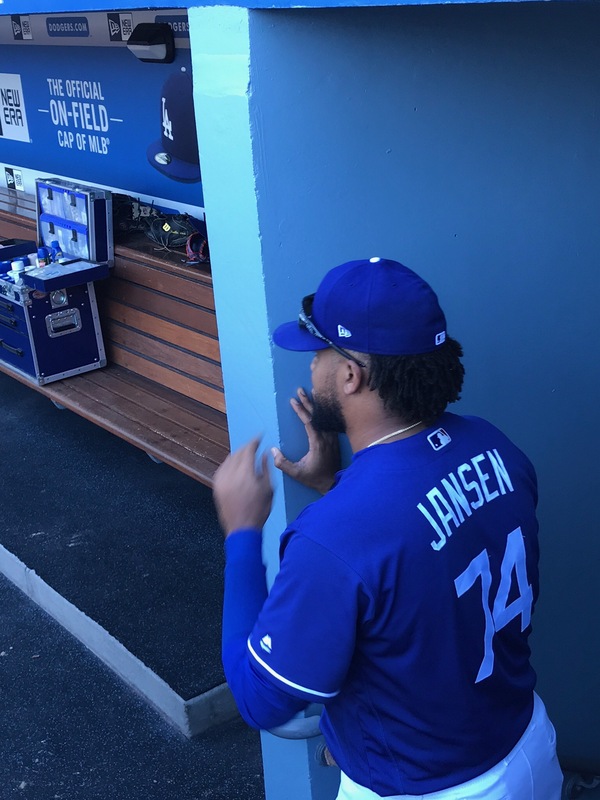 Thanks for stopping by and sharing my Dugout experience. 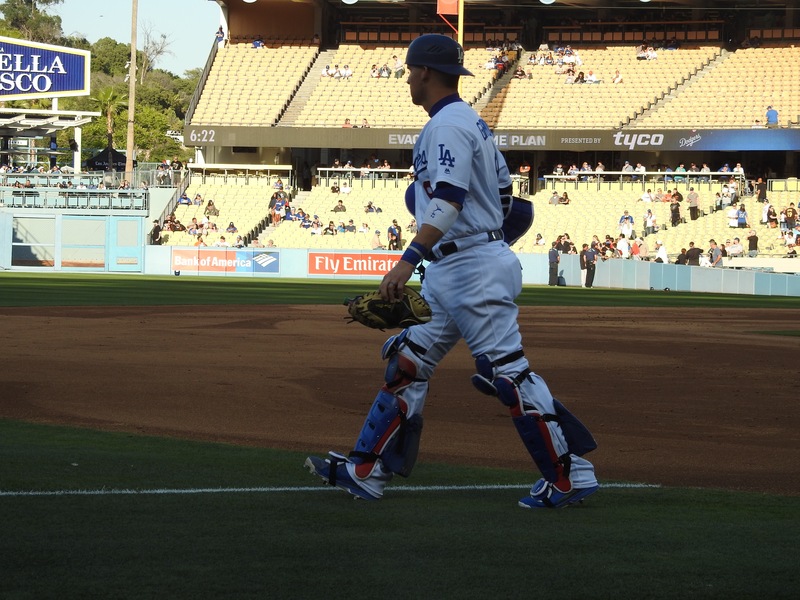 GO DODGERS!!! love love your blog, very detailed haven’t seen any blogs like this one, keep enjoying the games and the experience and write about them, and of course take lots of pics !! !